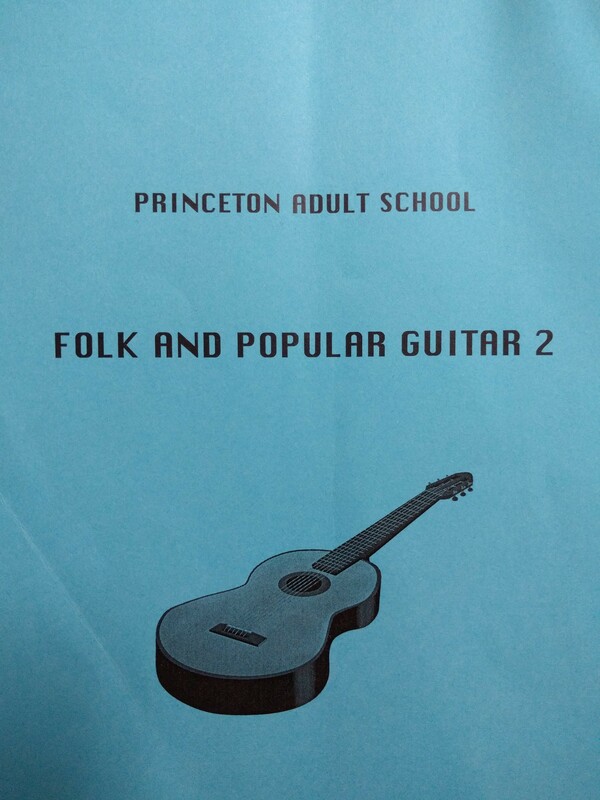 It’s been two and a half years since the intro guitar class I took at the Princeton Adult School, and I’m thinking back now with fond memories of the first class. 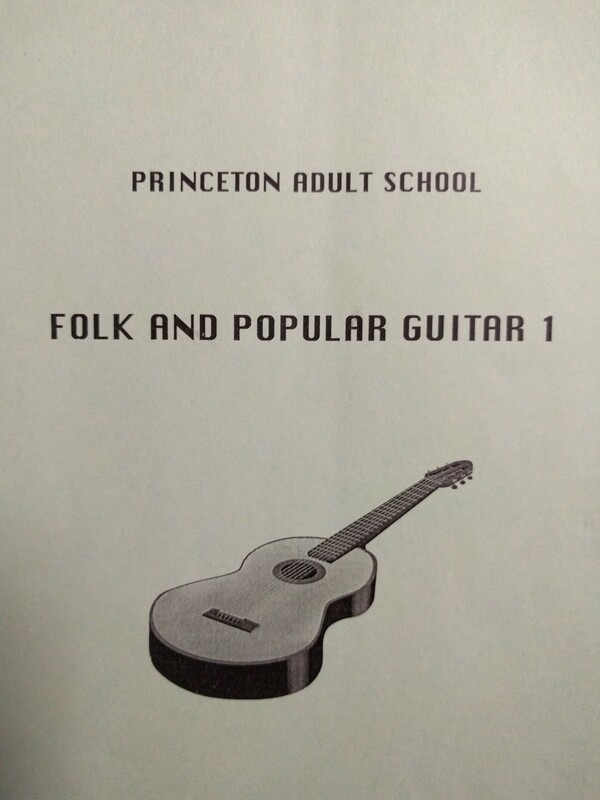 I had signed up for “Folk and Popular Guitar 1,” which went for about an hour on Tuesday nights and which was immediately followed by “Folk and Popular Guitar 2,” which also went for an hour. The level 1 class was at or near capacity, while the level 2 class apparently only had a few people. The same person was also teaching them both, the wonderful and energetic, CM (I’ll use her initials). Even though I had only tried playing briefly (for a month or so) many years ago, I got the same response when it got to my turn. I decided to stay for the level 2 class that followed that night, and though the pace seemed a little fast for me, I figured I would go with it. So I switched. I’d be learning more, and fewer people in the class would mean more attention from the teacher. I know – it’s the height of unreasonableness to expect something for nothing. I did keep at it though, and I kept learning and improving with each class and with the practicing between the classes. I’ve kept it going since then too, as I’ve continued to play, practice, write songs, and let go a little. I wouldn’t say irrational thoughts are completely gone, but the wall of perfection isn’t quite as high as it used to be. The point is to relax, trust yourself and where you’re at, and keep going. Keep working at it, and see what happens. It’s hard to imagine my life today without all the things that playing guitar, playing with words, and being musically creative bring. 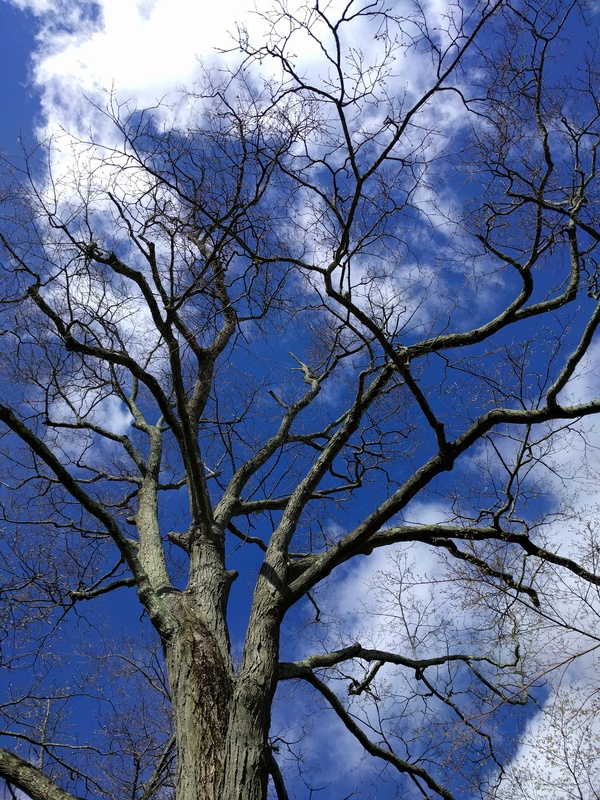 I wrote this song last fall, but it’s a spring song, and here we are still in spring. I used to hate listening to the sound of my recorded voice, but listening to this song makes me smile. It also makes me want to sing along, which I will admit I have done several times. I love how it feels to sing it, and now also, how it feels to read the words from top to bottom with the melody in my mind. Thank you too, CM, for the strumming start, and thank you to the many others who’ve provided inspiration along the way. 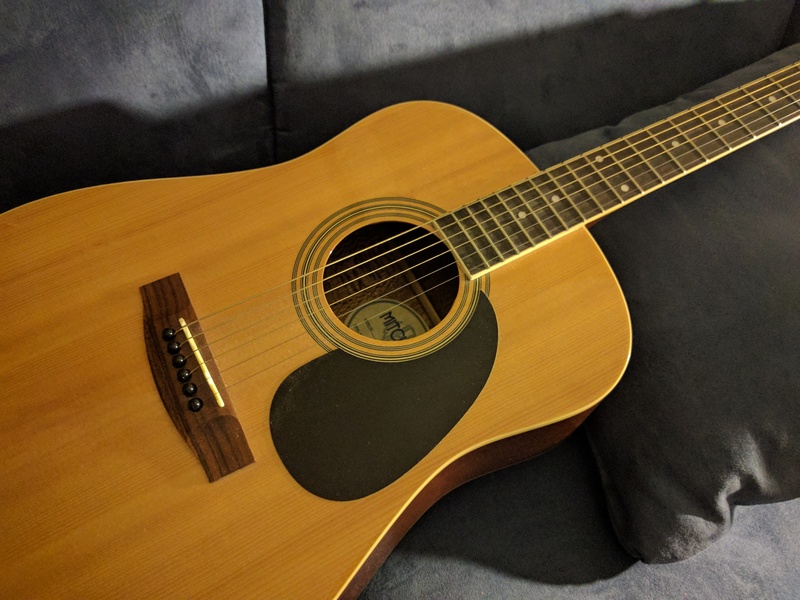 This entry was posted in Uncategorized and tagged appreciation, guitar, life, love, song, verse, words on June 9, 2017 by dave379. And art on my brother’s driveway. 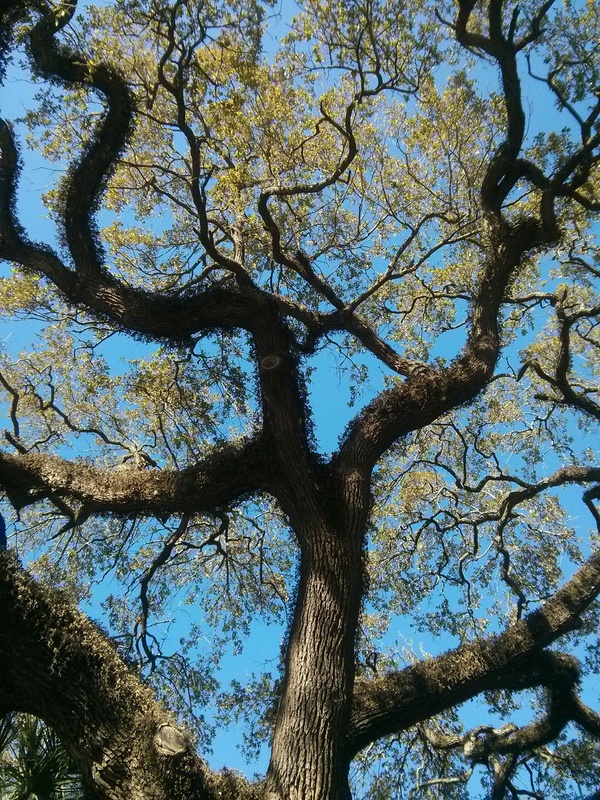 Oh, assonance… And consonance… And rhyme… And half-rhyme… Happy new year, and new post, to you too. Yes, a new year has begun (plus a few weeks now), and I’m happy to be starting it here with words and art, and to be sharing them with you. Words and art, yes, sounds like a good start. That’s one of several thoughts, or odds and ends, that I’ve been collecting. And here are a few more. They follow below, shared as always as a gift for me and you, to peruse and read and at your own pace go through. 1) Pots and Pans: I usually make a few resolutions at the start of each year (any time is good though), and this year was no different. On the afternoon of January 1st, I found myself creating a new note on my phone, a five-minute exercise that left me with some old favorites and general reminders. 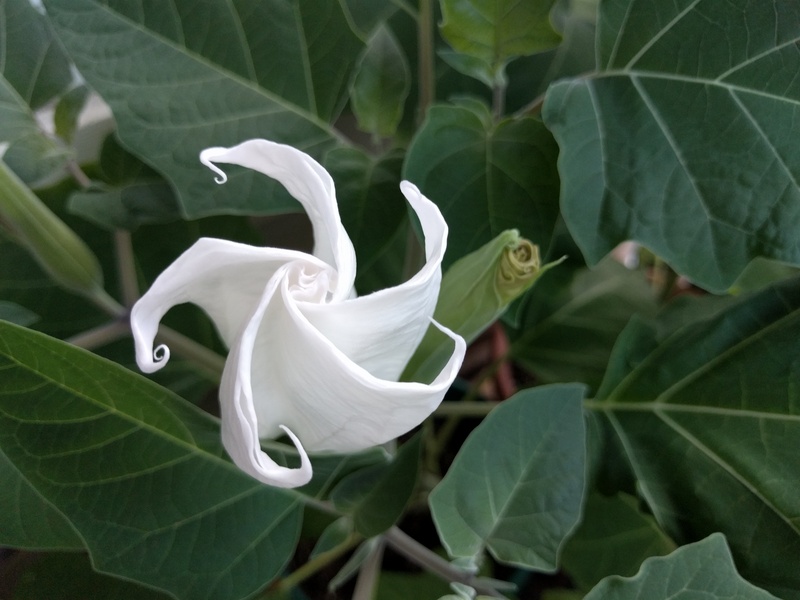 2) Planting Plant Plans: I have a lot of starter houseplants and a lot of pots waiting for them, so one of my goals over the next few weeks is to bring them together. I have a vision for a garden apartment, with the garden on the inside. Meanwhile on the outside, I planted some garlic. Planting garlic and growing and harvesting it is one of the easiest, and most satisfying, garden things you can do. It practically grows itself. 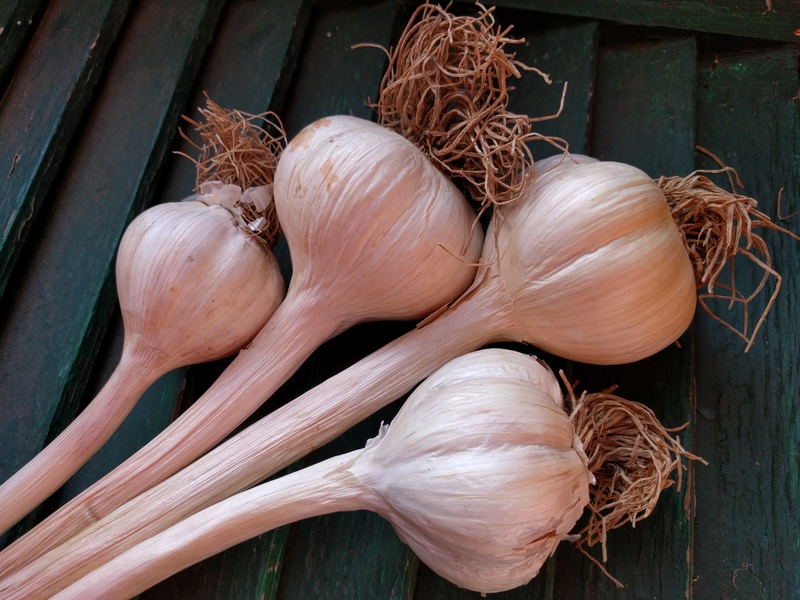 It’s like magic – each clove that you plant turns into a full head of garlic. If you’re interested, and I hope you are :), here’s what to do. 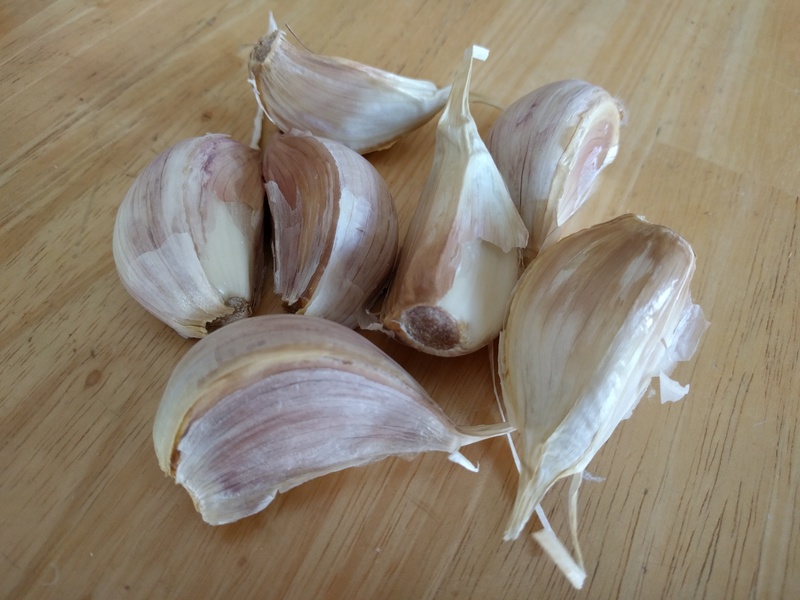 First get some garlic bulbs at the farmer’s market (the bulbs at the supermarket might have been treated to prevent sprouting). Then pull the cloves apart, leaving the papery husks on, and plant the cloves right side up about 2″ deep and 8″ apart. Usually, you plant them in late fall, but I’ve planted them as late as December…or also now, well, January 8th according to my notes. We’ll see how it goes! I also planted them in pots for the first time. It’s okay if the ground freezes after you plant the cloves too. The new plants should come up in the spring if not sooner. 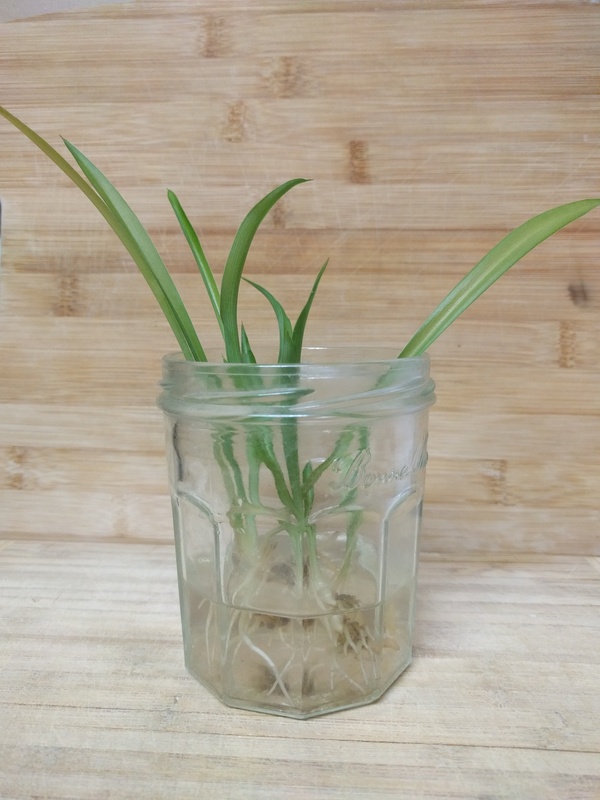 Then in April/May/June you snap off the garlic scapes (the green stems that start curling around themselves) to force more energy into the new bulb, and in June/July you harvest (dig up) the new bulbs when the leaves start to brown. The fridge in my apartment came with a freezer (I know, pretty cool, right? ), and over the past three years I’ve been doing my best to fill it. This was the actual view as of two weeks ago. The thing is, this was also essentially the actual view as of five months ago. I’d filled it over time, and then I got leftover and other-frozen-food usage paralysis. I knew what I wanted to do, which was to go through everything, use it all, and write about it at the same time. It seemed so daunting though, so I never got started. What would the rules be? Would I have to eat only from the freezer until it was all gone? (Meaning no cooking, i.e., not doing something I like?) How long would it take? Would I write a single post at the end about the process, or also one at the beginning? Or should I write several along the way? What if I started and it didn’t go like I thought it would? What if it didn’t work out? What if I messed it up?? Okay, brain, let’s hold the phone for a second there. 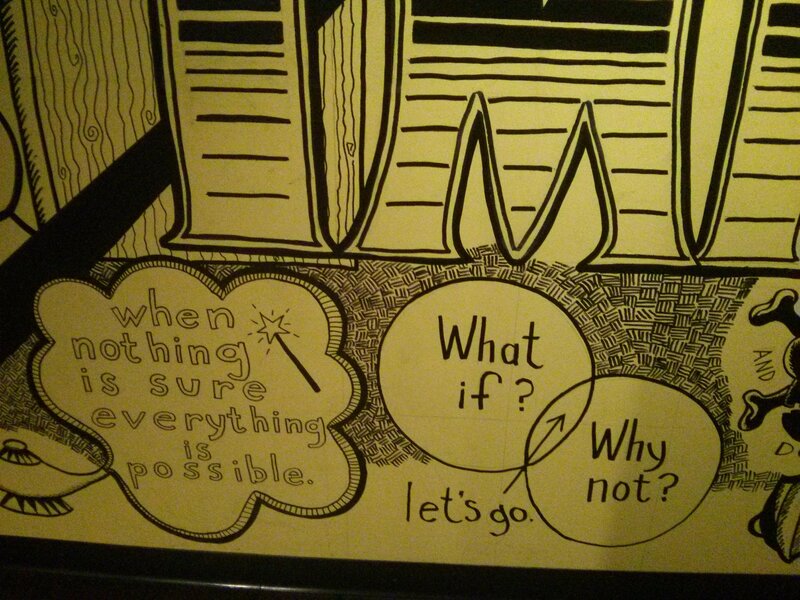 What if I just started and saw how it went? 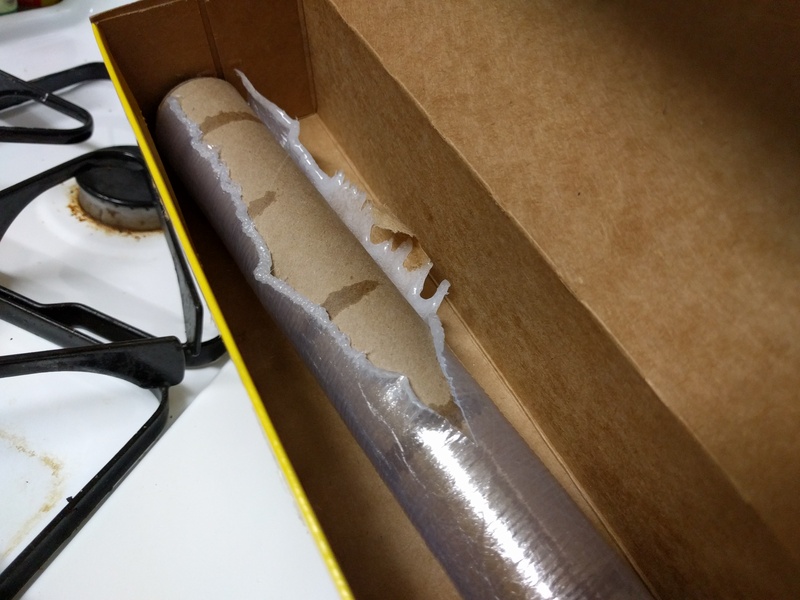 So that’s what I did (and recalled that, yes, that has worked many times in the past (ex. 1, ex. 2)). The beauty and the truth is that of course it’ll work, and that’s what it’s doing now, working out. Now a few weeks in, I’ve eaten or combined into new dishes several freezer items. I’ve also tossed a few items, a temporary affront to my ‘never waste anything’ ideal, but otherwise it’s going great. And it feels great. 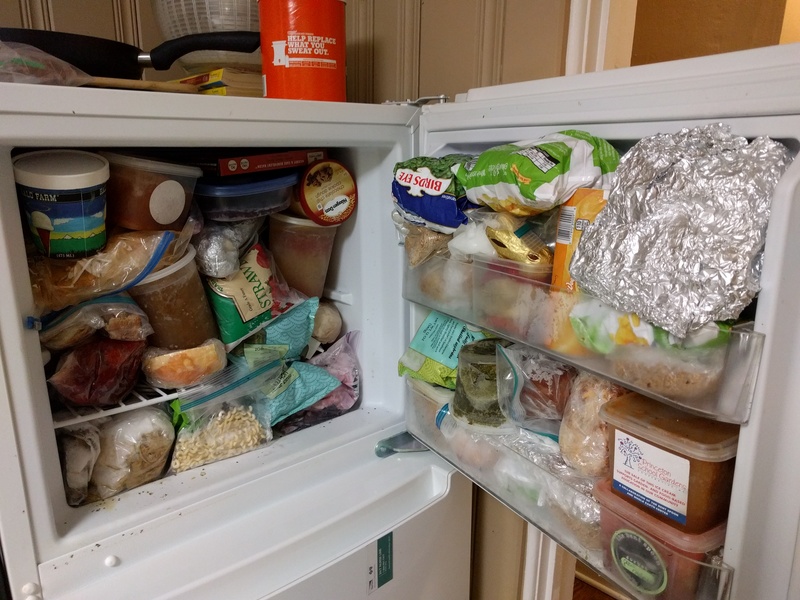 Item by frozen item, I’m cleaning up the freezer. I’m putting things to use, and I’m simplifying and letting go. Less is more. Food is meant to be eaten. And you have to start somewhere, so start where you’re at. 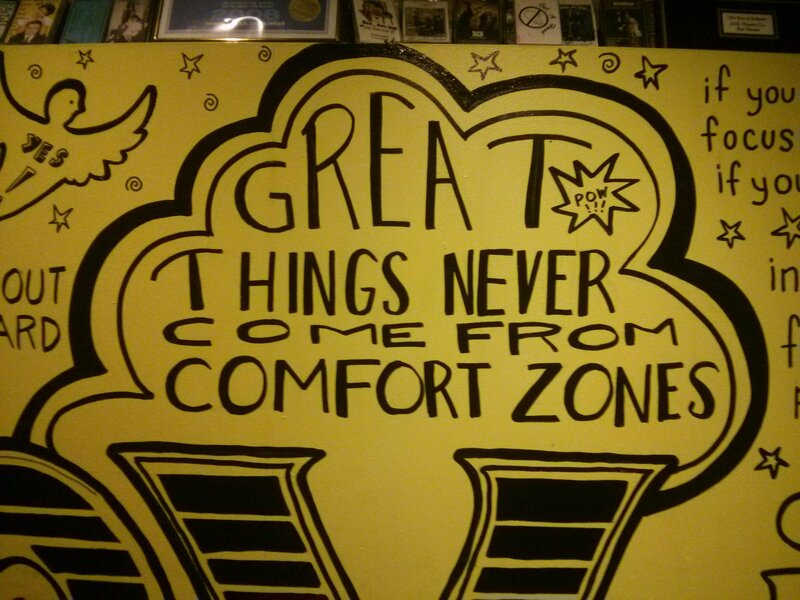 Get going. The rules are There are no rules. I’ll use as many things as I can, cook and combine them whenever possible, and take notes along the way, leading to probably a final post but perhaps some interim ones too. I’ll figure it out as I go. I signed up for the New Jersey Marathon! Yay! That decision, made two months ago, was followed by me starting to increase my miles and do some speed workouts. Also yay, except that my doctor had advised against doing the latter workouts so as not to aggravate a minor hip injury. After about three weeks, I realized I should have followed his advice. Boo. 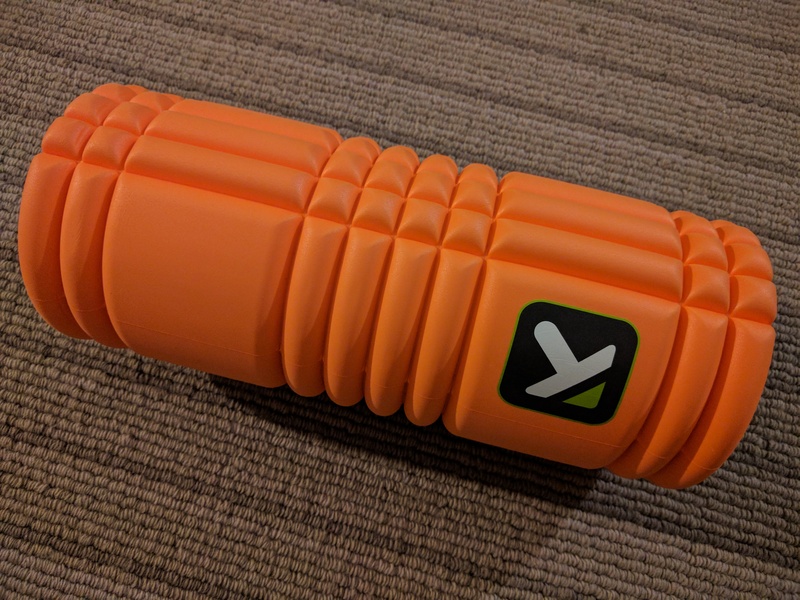 So I bought myself a foam roller (thank you, Princeton Running Company) and have been doing some eggplant side-rollatini-ing. And doing way fewer miles. And going slower. I also starting some physical therapy (diagnosis: gluteus medius strain (yup…weak cheeks)). The calendar reality is that I don’t think I’ll be doing the marathon now. Maybe I could still do the half, but we’ll see. My freezer file mind is reminding that it’ll all work out, and that once again, as always, I should start where I’m at. If you can’t run 10 miles, run 3. If you’re injured, do PT. If you have an itch in the middle of your leg, scratch your knee. This one deserves to go in the opposite direction of alliteration. – Words heard and felt today in Washington, D.C.
How lucky are we, how lucky am I, really. I have friends I can march with. I can take care of my body, and my mind. I have a freezer full of food. I have plants. 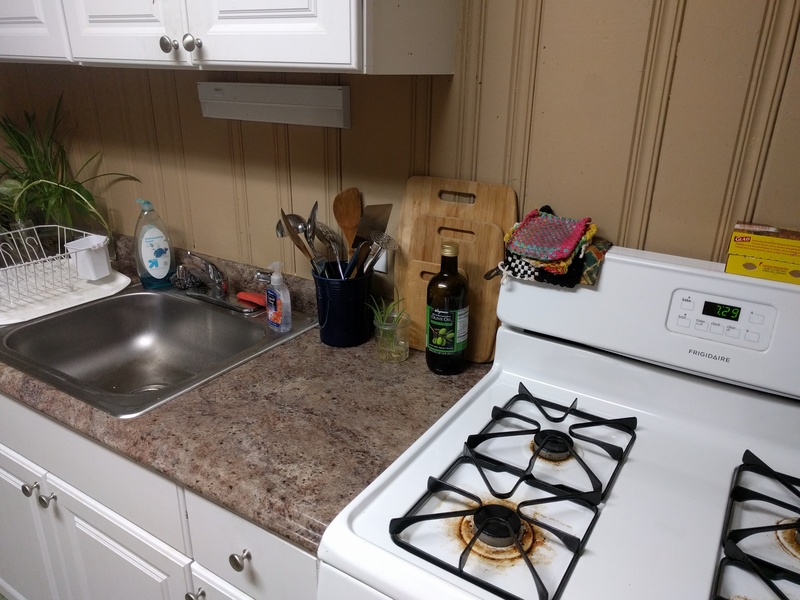 I have a kitchen. I have words, and I have art. There is art on driveways (thank you, artist sister-in-law). And there is art on my kitchen table, a rotating temporary art installation. The current view includes tomatoes from the community garden at work, grapefruit from my mom, and odds and ends from myself and friends. 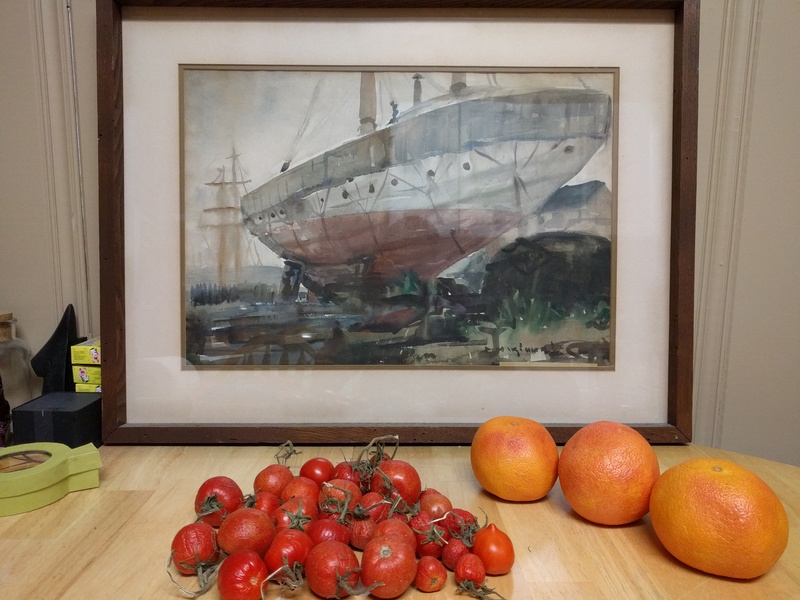 The view, the backdrop, also includes one of my grandfather’s watercolors, a gift a few years ago from my great aunt. There was a time I thought I would hang it up one day, but I’ve realized I like where it’s at. Along with everything else, it helps make for a full table. And it feels good. 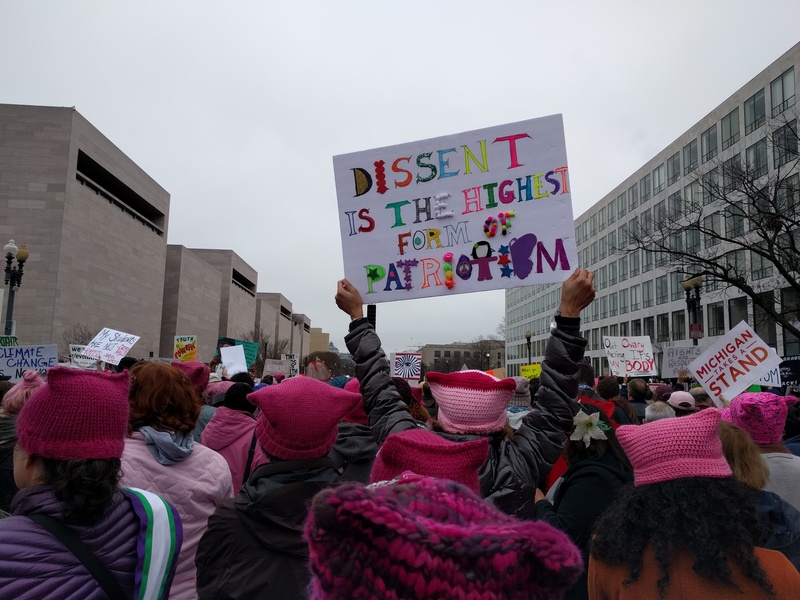 This entry was posted in Uncategorized and tagged art, family, food, friends, garden, garlic, life, resolutuons, running, verse, womensmarch, words on January 25, 2017 by dave379. And dancing to it all in time. Each time, a lullaby for the heart. These stanzas may or may not make it into a future song, but they’re true. I actually gave a small preview of the song below in a post a few months ago, Orlando in words and pictures – Part I. I was singing it then, I was singing it a year ago when I wrote it, and I’m singing it today. 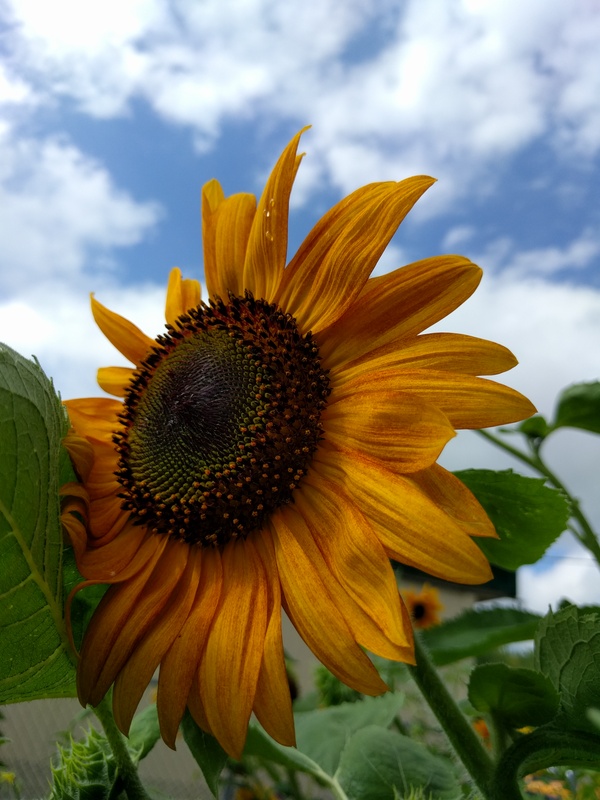 This entry was posted in Uncategorized and tagged community garden, flowers, home, life, love, moonflowers, river, shine, song, sunflowers, verse, words on August 30, 2016 by dave379. Kitchen tips and kitchen blips. The truth is in the reading. Now for all to see. 1) Did you know: You can use the hot air that comes out of the oven vent for more than just passively heating your kitchen?? Kitchen tip: When making pumpkin bread (or zucchini bread or lemon pound cake or the like) and waiting for the oven to preheat, you can put your 9″ x 5″ x 3″ loaf pan under the vent, and the hot air will melt a small tab of butter for you, for easy greasing and flouring of the pan. 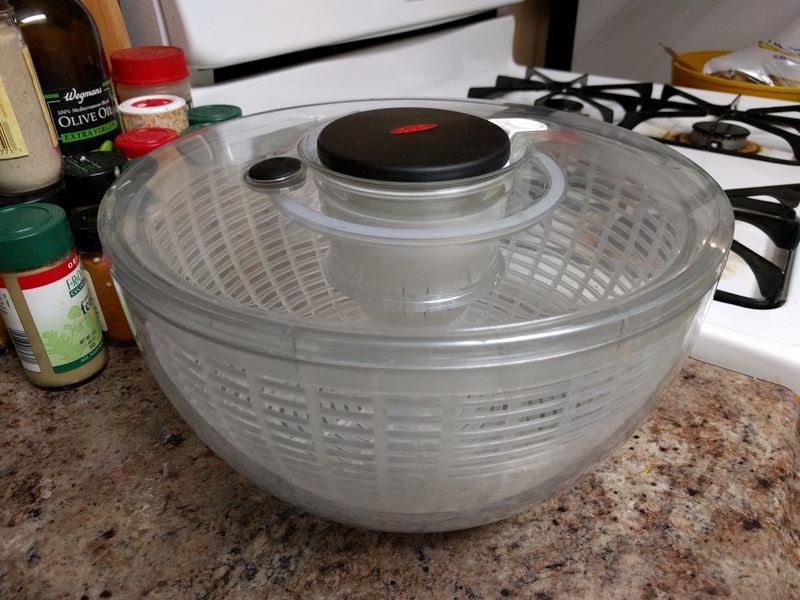 Kitchen blip: You could also put your salad spinner under the hot air vent as a way to speed the drying process and save time, but then you might, well, happen to melt the plastic such that the the spinner no longer spins. 2) Did you know: You can use the stove-top’s flat surface for more than just cooking food?? 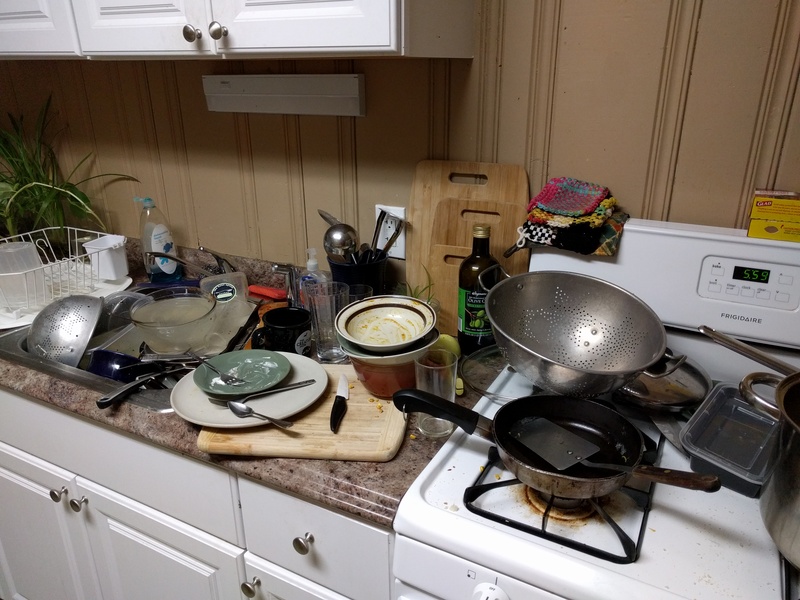 Kitchen tip: When doing the dishes, and when the dish-drying rack is full (and when the rest of the counter is covered with starter houseplants growing in pots), you can set the extra dishes on the stove-top as another place to let them dry. Kitchen blip: This might seem like a good idea, and it is, most of the time. When it is not a good idea is when you might, well, mean to turn on the front burner but instead turn on the back one, which is fine until you realize you have a glass dish with a plastic lid sitting on the burner in the back. 3) Did you know: Vodka sauce isn’t too difficult to make?? 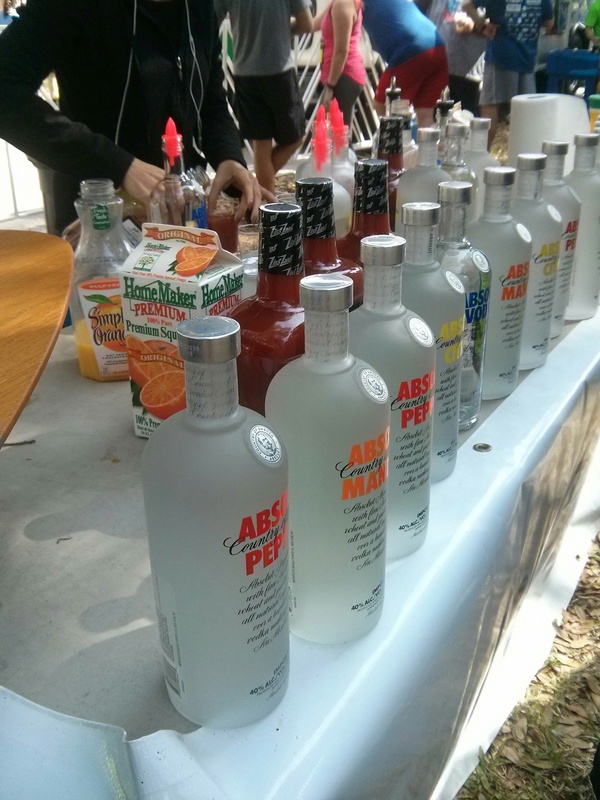 Kitchen tip: All you need is vodka, tomato sauce, heavy cream, and some other ingredients. And a little practice, to figure out the right amount of vodka, when to add it, and how long to simmer it off for. 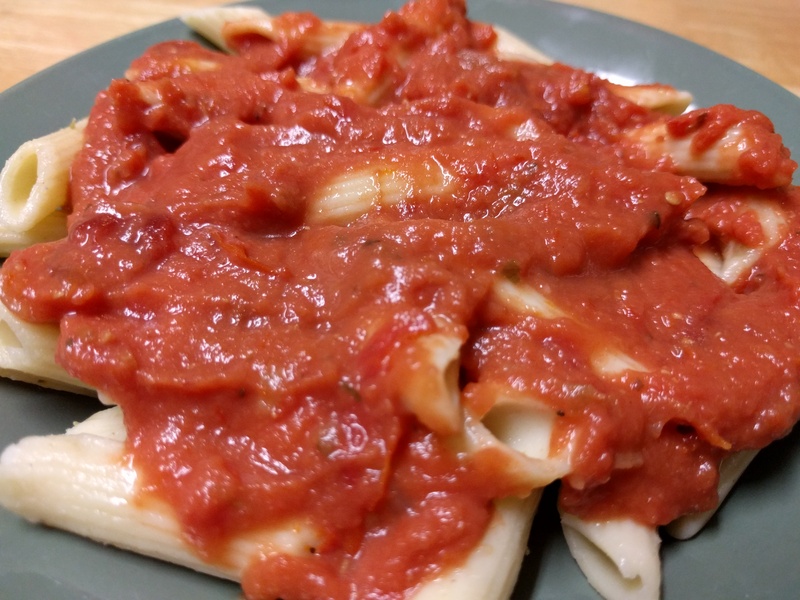 Kitchen blip: Vodka sauce can help make a meal feel higher class – and penne vodka would go great with a big Italian-themed dinner, like the big fundraising dinner I did two weeks ago for the Anchor House. Vodka sauce can only help in this regard when it makes an appearance though, rather than remaining in the fridge because you might have, well, added too much vodka at the beginning or not let it simmer long enough. When I tasted the sauce while it was in progress, I thought, “Hmmm, it’s got a little too much vodka taste…I know, I’ll add some more crushed tomatoes!” I didn’t want to throw it away and start over, so rather than doing that and cutting my losses, I…cut my losses by adding more tomatoes. And then I added some more tomatoes. And some more after that. But it wasn’t working. Until I had more time another day. When I came back to it a few days later, I found myself rewriting the script. This time rather than cutting my losses, I cut my gains. I started with some new crushed tomatoes, and then I added a smaller amount of the not-quite-right-yet vodka sauce to it. With some trial and error, I figured out that in this case, I needed 2 parts new tomatoes to 1 part old vodka sauce. Which is to say: I found my gains by starting a-gain, and the result wasn’t perfect, but it was perfectly post-party edible. And now, in the freezer at work (the one at home is full), I’ve got approximately 64 ounces of new vodka sauce, ready to go. And tomatoes placed with some knowing. 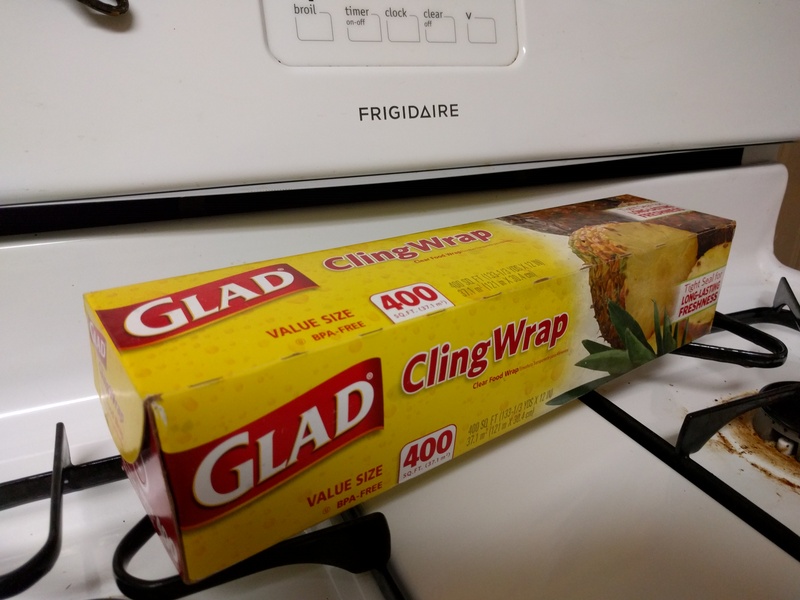 Bonus: Kitchen tip and kitchen blip: There are many places in the kitchen you could place the plastic wrap. 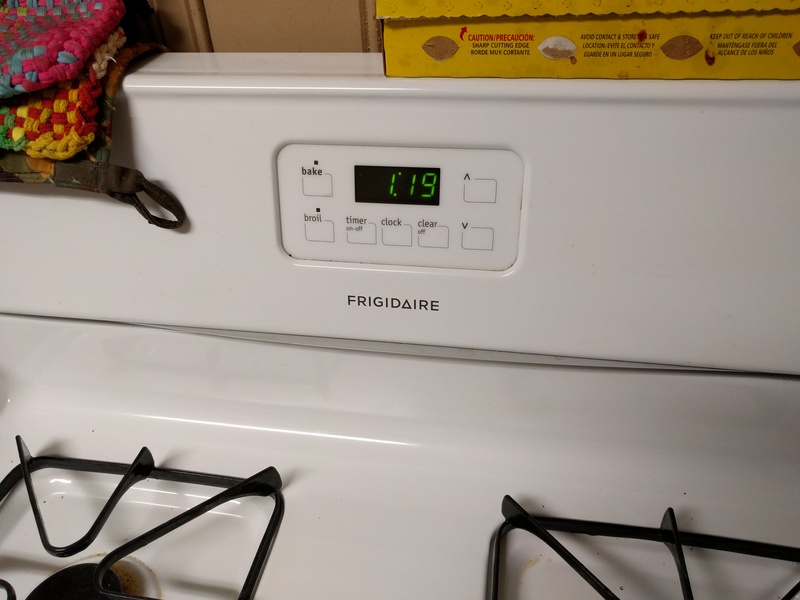 On top of the stove’s back panel works, but a little down below? Not so much. I mentioned that hot air vent thing, right??? This entry was posted in Uncategorized and tagged blips, food, hot air, life, oven, rhyme, tips, tomato sauce, verse, vodka sauce, words on June 30, 2016 by dave379. Right now, in the present moment, I am sitting on the porch steps in front of my apartment. 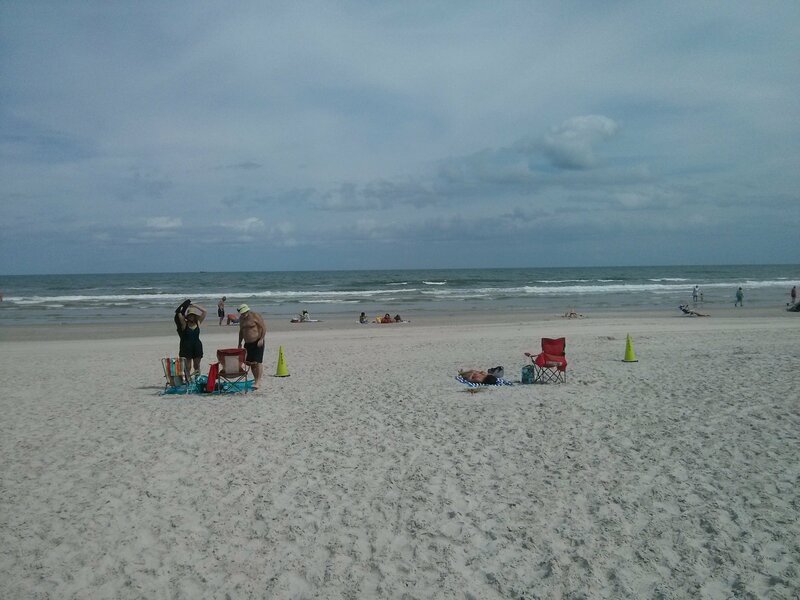 I just re-read my last three posts, the story of my Orlando trip, and it’s time for one more, part four. Part IV is Orlando, in song. It’s all part of the story – the process and the progress, the love and the hope, and the bits in between where I fail, learn, and grow, and have the courage to share it for myself and others, to tell, turn, and show. I’m doing my best, and I’m proud of the storytelling, and the story-living. I went for a run in my hometown this weekend, on streets I’d never been before, and found myself making up the route as I went and trusting that I’d make it back alright to my friends’ house. And I did make it back, and at the same time made it forward, with good thoughts including the one that All roads lead home. We all have it all within us. With peace, self-love, hope, letting go, and faith, I share with you the next part: Orlando, in song. This entry was posted in Uncategorized and tagged art, home, hope, life, love, Orlando, process, progress, song, storytelling, verse, words on May 9, 2016 by dave379. And now, we return to Orlando. Welcome back, for Part III. 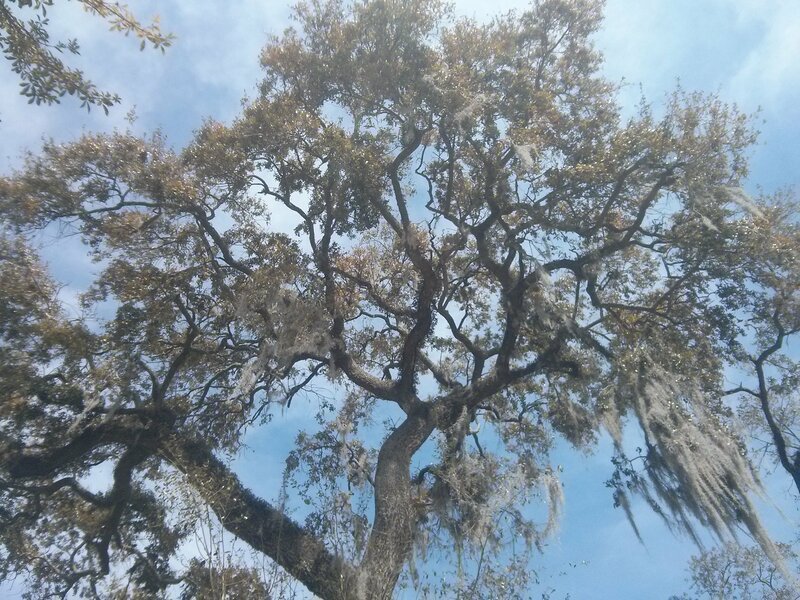 When I woke up that Friday morning, my fourth day in Orlando, I knew I had one main choice to make for the day: whether to go back to Wekiwa Springs State Park and go kayaking for most of the day (as I originally thought I would do – Part 1) or stay in the city and relax. I wanted to do both, but thinking of all I’d done on Thursday (Part II) and what I most wanted out of Friday, I chose the latter. 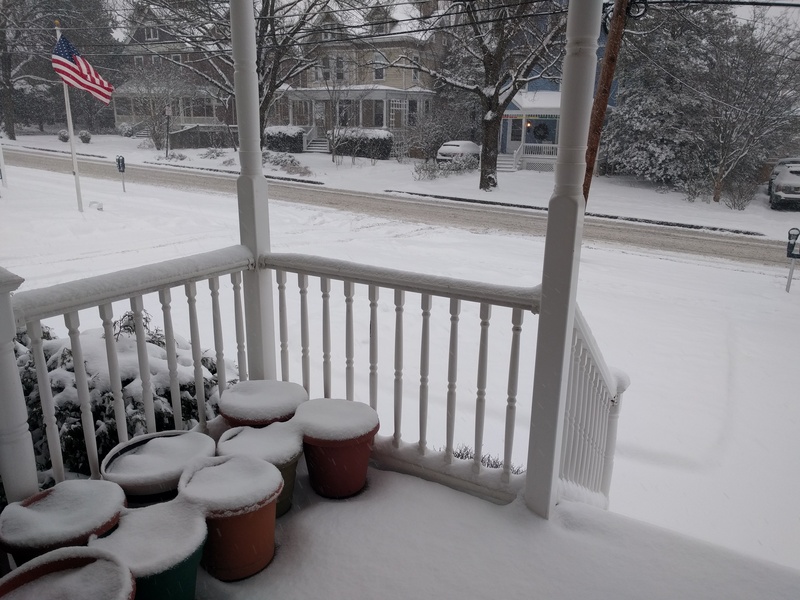 The decision was actually easier than I thought, and my feeling that it was the right decision was confirmed during my morning run, an easy 35-minutes around town. Yes, this is what I want to be doing, I thought as I jogged – taking it easy, not rushing, and letting come what may. What if I didn’t worry and just did that? Yes, let’s go. 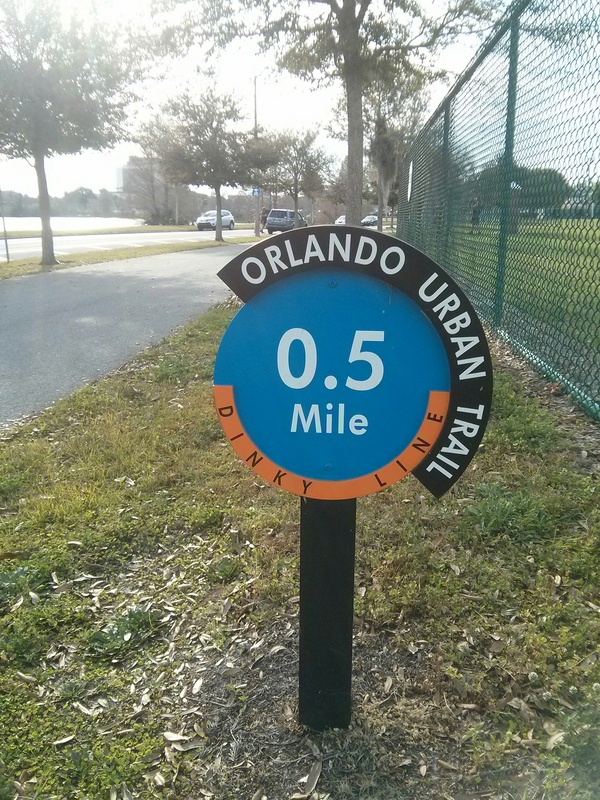 About ten minutes into the run, I got to the Orlando Urban Trail, a paved running and biking trail similar to the Cady Way Trail that I’d been on two days earlier. I couldn’t believe it, but there it was, in Orlando – the Dinky Line! This was remarkable because in Princeton we have the Dinky too! Technically it’s the Princeton Shuttle, a 2.9-mile NJ Transit commuter rail line that connects Princeton and Princeton Junction (where you can then go north to New York, or south to Trenton and Philly). To anyone who’s local, it’s the Dinky. I promised myself I’d come back later and get a picture (which I did the next day). 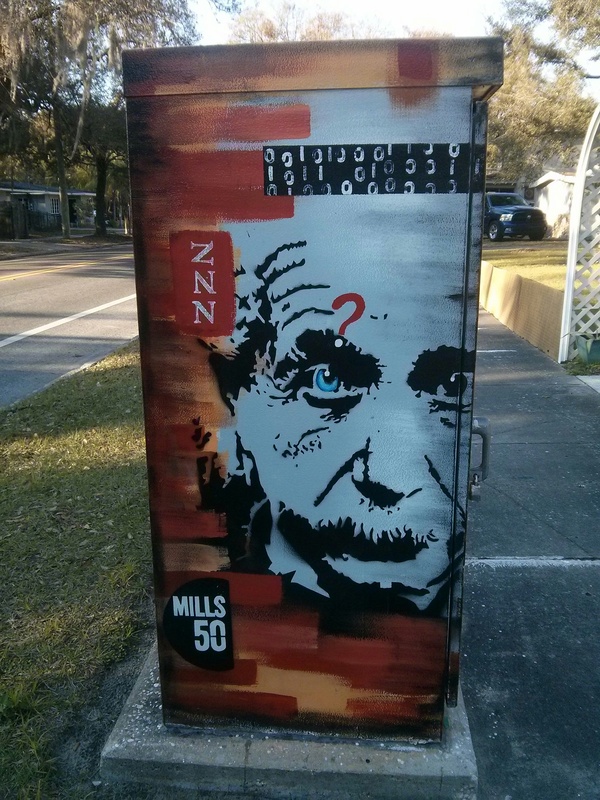 With a Dinky-inspired smile, I continued on my run, passing through Lake Eola Park, Thornton Park, and then Mills 50 on my way back to my Airbnb. Along the way, I found myself smiling again when I happened upon another reminder of home. 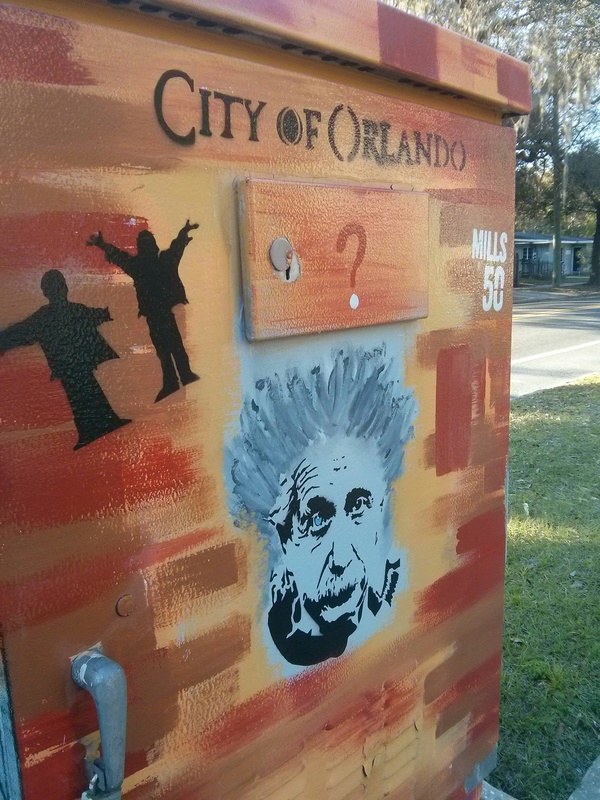 Yes, in the Mills 50 neighborhood in Orlando, at the intersection of art and utility boxes, there’s an orange Einstein. It’s good to get away and leave home for a fresh perspective. And it’s also good, when you’re away and relaxed, to be reminded of home. 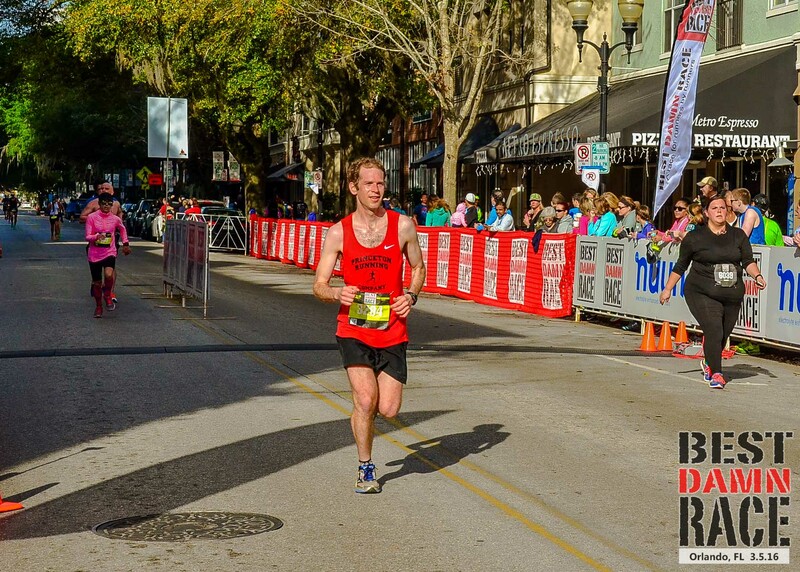 I was running at the pace of Dave, feeling a greater sense of self and doing what I wanted. And then, without trying, I found the Dinky and Einstein. I was away from home, yet I was at home at the same time. What if I brought some of this home back with me? 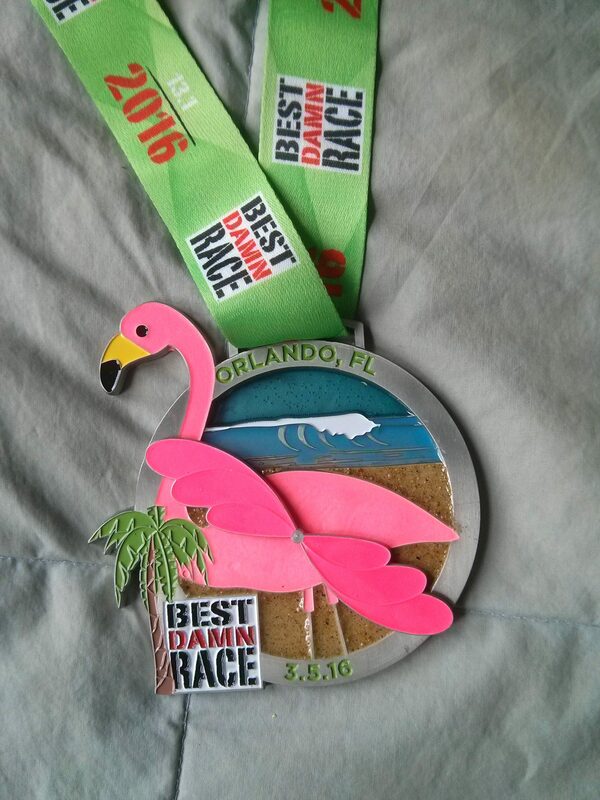 One of my reasons for dedicating the day, Friday, to relaxing and local exploring was that I was doing the Best Damn Race Orlando Half Marathon the next day. I didn’t want to rush when picking up my race packet, and staying local meant I could also take advantage of the kitchen in the Airbnb to cook my favorite pre-long-race meal. For a while, this pre-race meal (whenever possible) has been homemade tomato sauce and pasta. And that’s what I made. Crushed tomatoes, garlic, onions (the ones that I’d picked the day before at the farm! ), olive oil, salt, and pepper. The leftovers were also good the next day after the race, and on the plane ride home on Sunday. 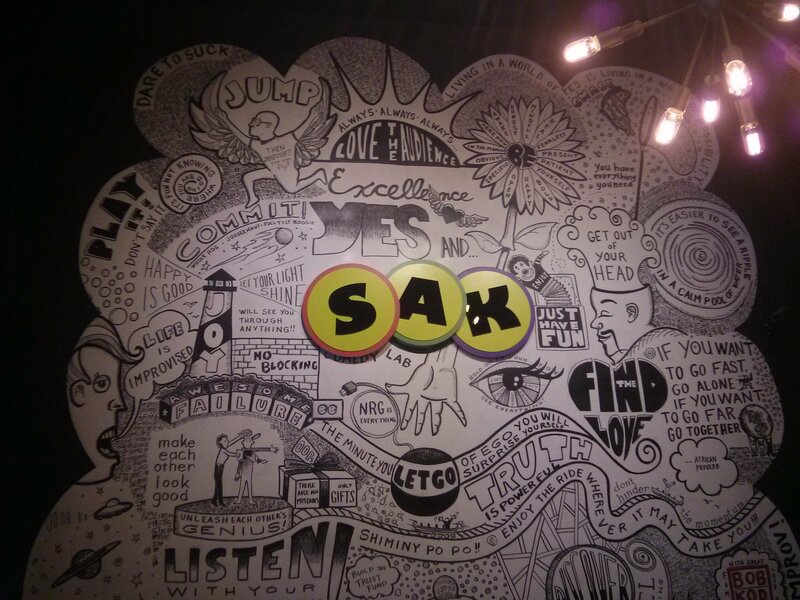 After dinner, I wrapped up my Friday by going to an improv show at SAK Comedy Lab in downtown Orlando. 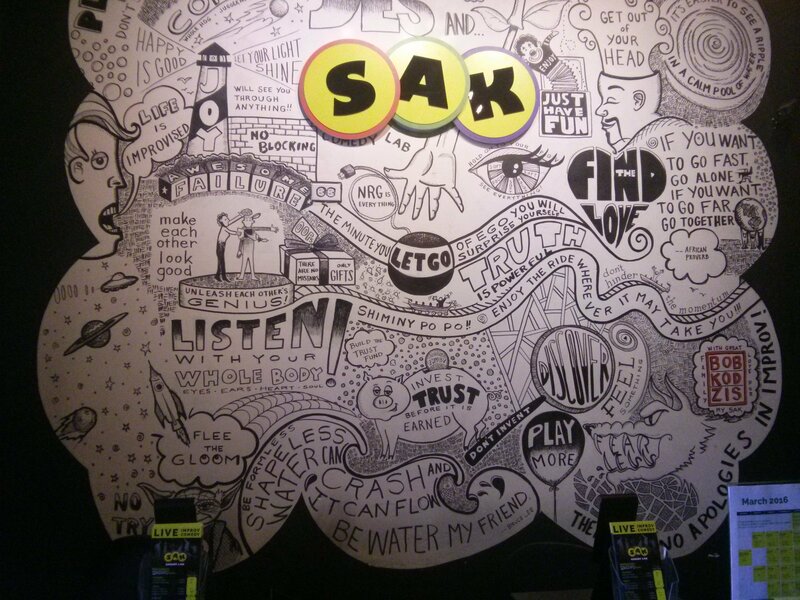 I’d heard about SAK from someone at Tasty Tuesdays, and having done improv myself recently with some friends at home and knowing how hard/easy/stressful/freeing/awesome it can be to do – you should try it! if you want to – I was looking forward to seeing a live show. 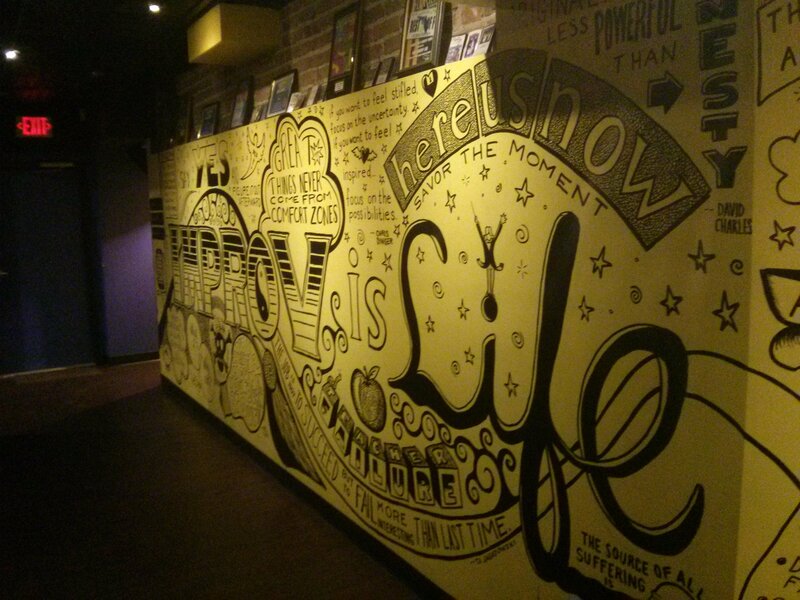 The show was great, and on top of that there was also the wall-art with the improv of life reminders. I had initially stopped by SAK in the afternoon to buy a ticket. Seeing no one at front desk, I continued on in and headed up the stairs. 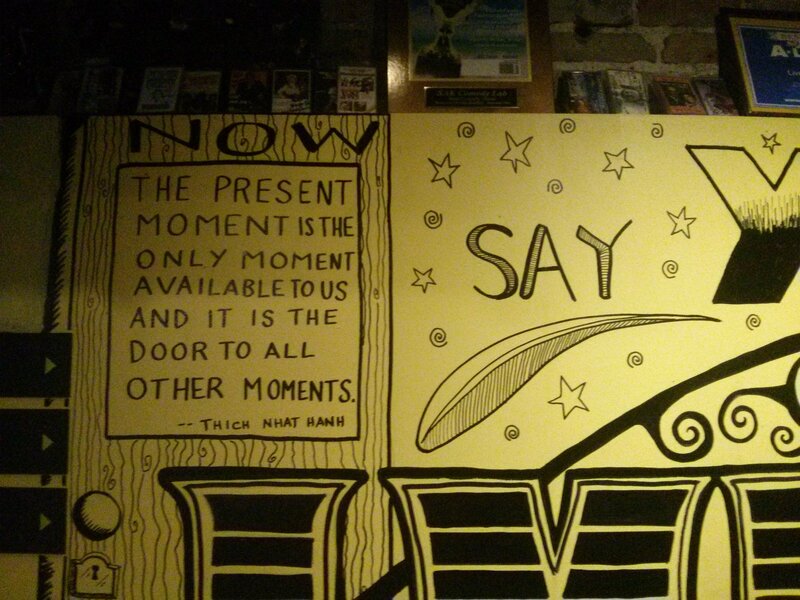 While looking at the Improv is Life wisdom-inspiration murals, I ran into the person, Dale, who would be hosting the show that night. He gave me the details on the tickets (can reserve them online) and the art (one of the performers, who is also a visual artist, designed everything). Sometimes at work in the morning, I’ll write daily intention reminders to myself on a yellow post-it. I didn’t realize it at the time, but taking these pictures at SAK was like doing the same thing, on a larger scale. 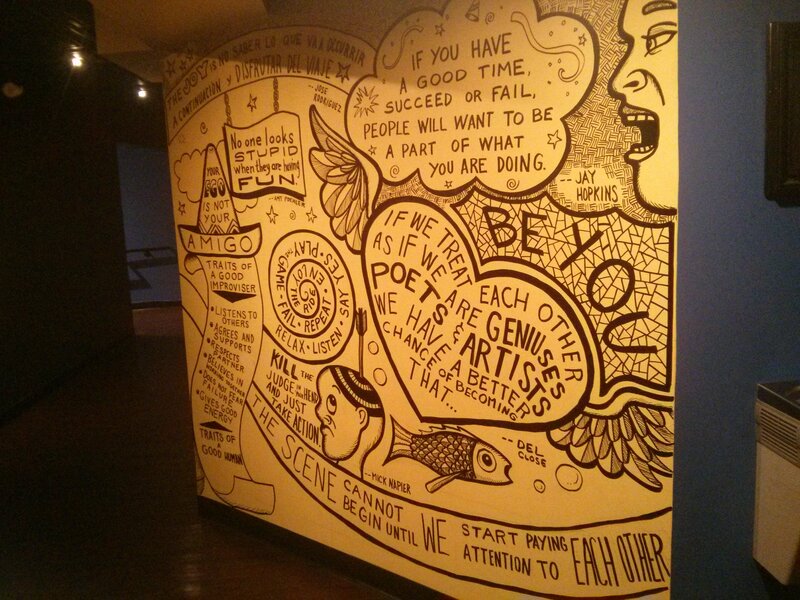 I invite you to click, expand, and pan through the murals and see what thoughts and ideas resonate with you. And to see an improv show, and to try it too. Friends old and new and not yet known. For my last day in Orlando, part one was doing the half marathon. When I had originally signed up for it, I thought it would be my weekly long run as part of training for a spring marathon. I never found the right marathon motivation though, so I never signed up for one. This is also to say that had there been any doubt, my goal for the Best Damn Race Orlando Half Marathon was at this point definitely to have it mirror my goal for the trip as a whole – to move myself in the direction I wanted to go in, relax and enjoy it, and welcome the outcome and whatever comes. I found and welcomed the sunrise on my way to the start. 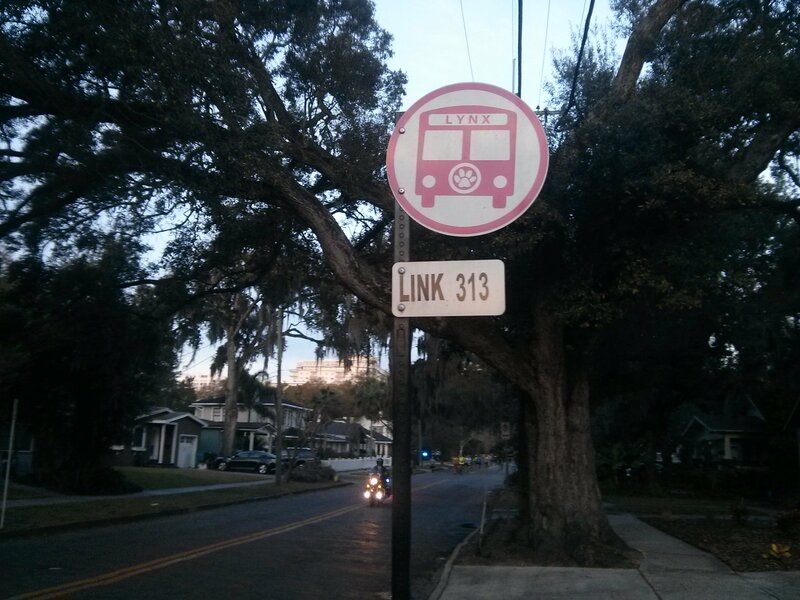 I also found my lucky numbers, 313. No better a birthday, or combination of primes, has the world known. I may be biased though. 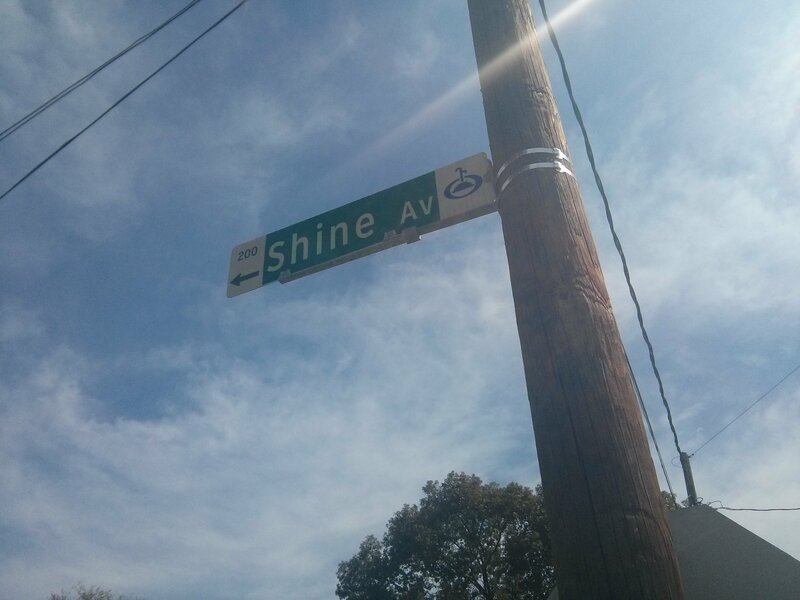 The route took us through some familiar neighborhoods and streets, including Shine Ave. There might have been delays for the cars that morning, but I wasn’t feeling any because, me, I wasn’t in a rush. I’ll race a race once in a while, but more often lately what I’ve been doing is appreciating the beauty of running at the pace that feels right for the day. I didn’t want to run as hard as possible and injure myself, so I didn’t. And I wanted to run at a more relaxed pace and enjoy it, so I did. It felt great, and I ran a few fun, faster miles towards the end. And I finished and lived to run another day. I only had one of these recovery drinks. You saw all the sweat in that picture of me running, right? A few days later when I looked at the results again, I was like, Wait a second, wow! My gun time was 1:36:36.9, which meant that If I had kept running and were able to keep the same pace for a full marathon (that is, if I kept training and were then able to keep running the same pace), my final time would be 3:13:13! I’d found my numbers again, and again without trying. Back to my last day in Orlando, post-half marathon, I had one final decision to make: to DRIP or not to DRIP. 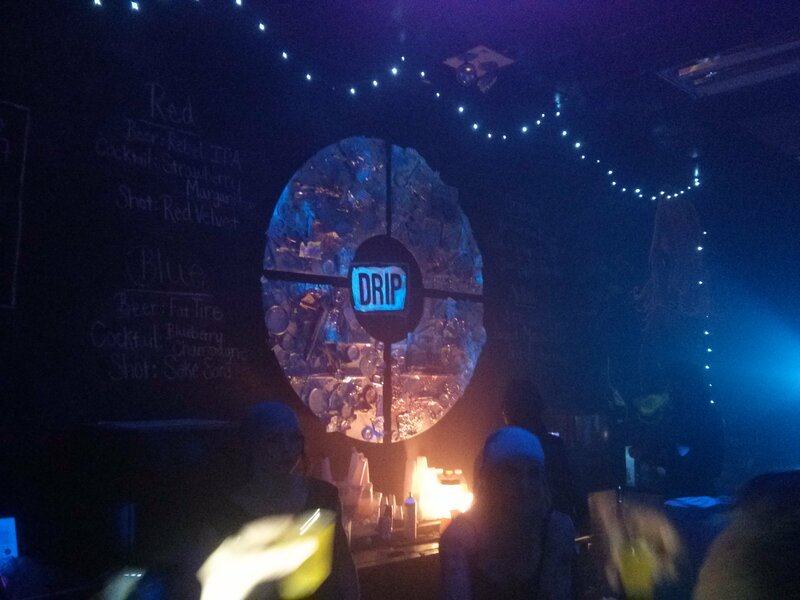 At the bar a few days earlier, I had heard about what sounded like an awesome performing-arts show, DRIP. 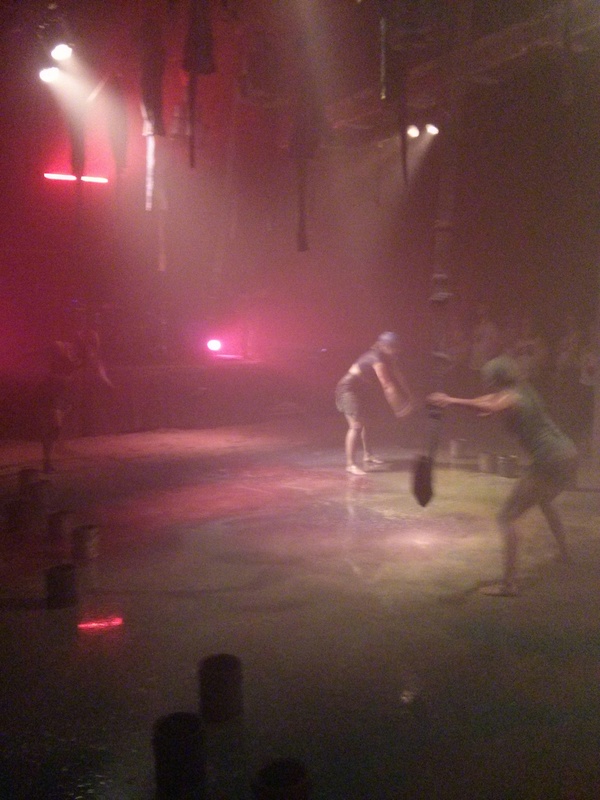 Imagine dancers moving, choreographed paint and water and sand flying, colored lights moving, a live rock band playing music, everything happening in a dark and intimate warehouse bar setting, and the audience standing and watching on the edges of the performance space and becoming an increasingly painted and wet participant. And picture the audience coming early to get a drink and paint each other and hang out, and then doing more of the same afterwards. 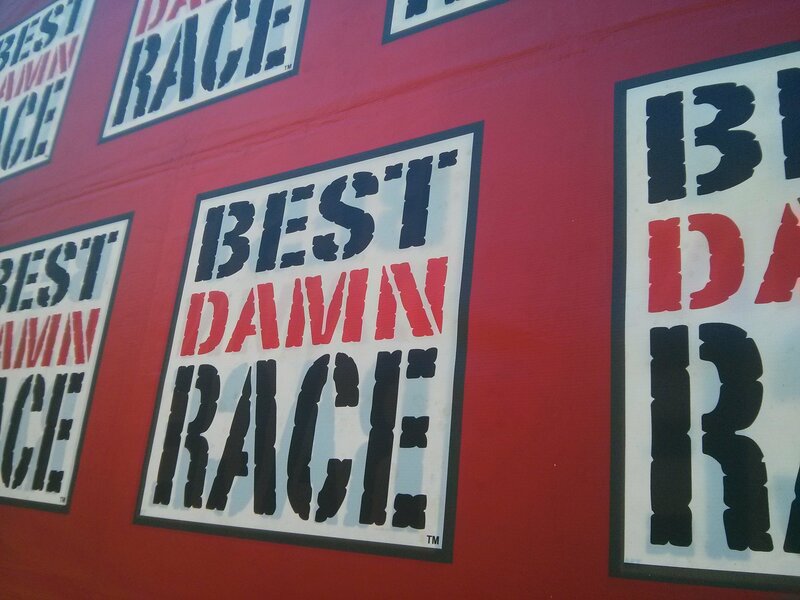 It sounded great, and I thought, “I should go to that. I want to do that.” Adding to the awesomeness was that I only learned about the show because I happened to visit a particular bar (recommended by my hosts) and happen to sit in the one spot at the bar that I could have sat, at the right time, to happen to have a conversation with the woman, Mariko, who happened to be the creator of DRIP! My plan was to check it out my last night in Orlando. 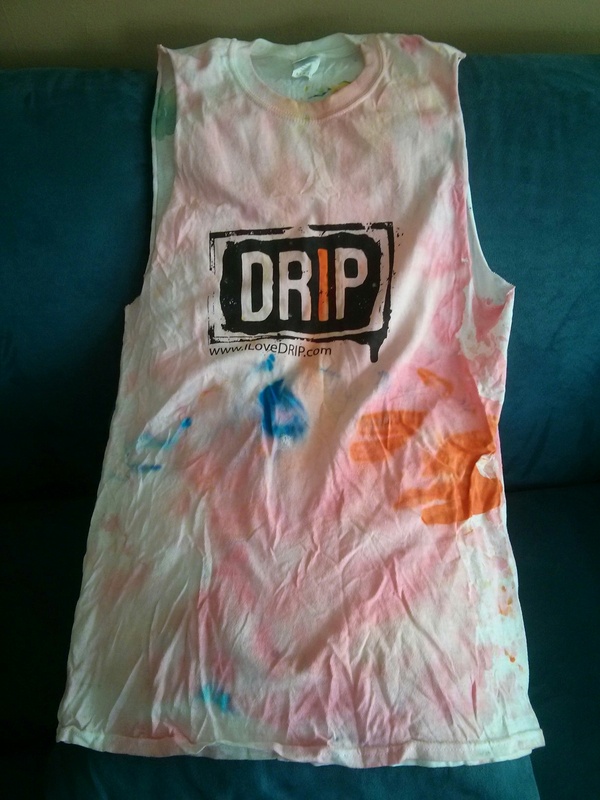 Drip with sweat while running in the morning, and then drip with paint while seeing DRIP in the evening. That afternoon, though, I started dragging. 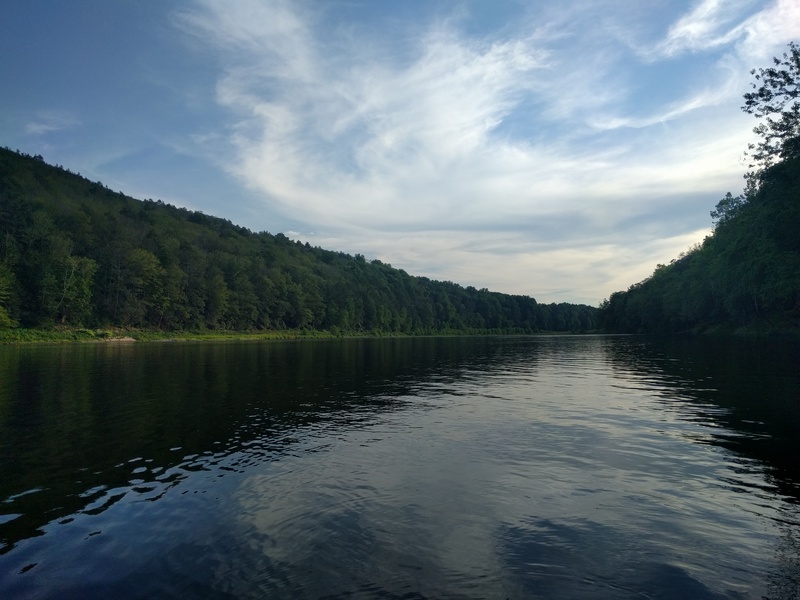 Whether it was the good running-feeling subsiding, the growing thoughts of my pending return to regular life at home, or something else, I started feeling the stress and worry that I had been doing good at managing. So I took a beat and let myself be. After getting my Dinky picture, I crossed the street and found a warm spot on the grass near Lake Highland. And then I laid down on my back, resting, breathing, looking up, not looking at anything, now with eyes closed, and I let my thoughts come and go, and along the way came the understanding that I would do whatever felt right and that that would be alright. If a more low-key evening is what was moving me, then that’s what I would do. If DRIP became the stronger part of my compass, I’d move in that direction. 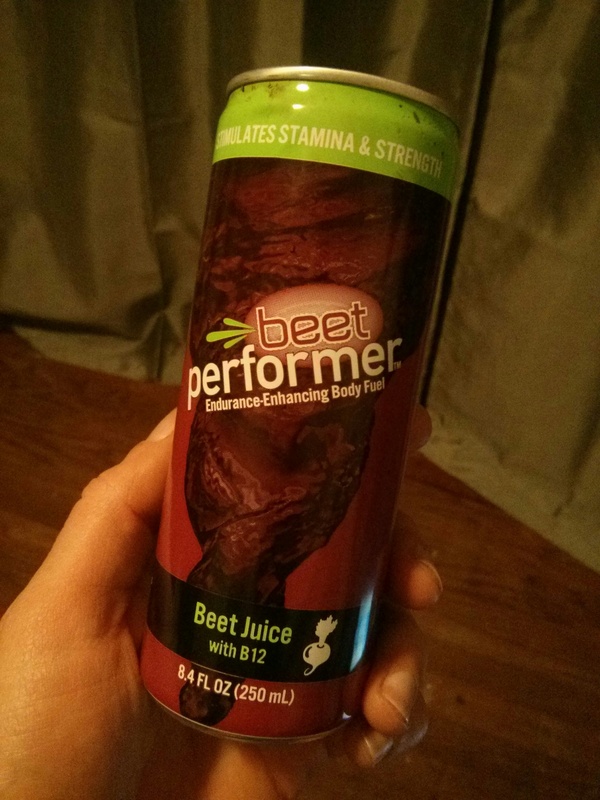 The first sign in favor of DRIP was the beet juice, which I’d gotten in my race goody bag. 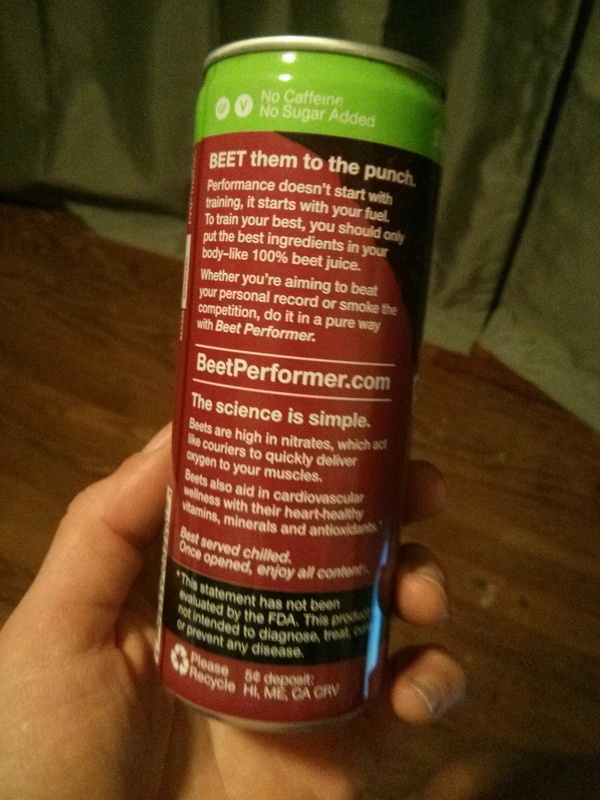 Beet Performer is 100% beet juice, and well, one sip confirmed for me that it’s not my cup of beet juice tea. This also explains why I had an open, nearly full can of beet juice in my rental car’s cup-holder, which was fine until I unexpectedly backed into a curb while parking, leading to the beet juice spilling and leaving a large maroon mark on my arm. How about that, I thought, I just painted myself. Then next came the thrift store, which is what I was parking for. If I went to DRIP, I wanted to get a pair of flip flops, as Mariko had mentioned how most people wear old clothes and sandals that they don’t mind getting paint on. And what would you know: the thrift store had my exact size. I also got The Muppet Movie (a classic, for my nieces) and some reading for the plane. The final push to DRIP was a therapy-like conversation I had with a bartender a short while later while eating dinner. The thoughts and talk on my end went something like this: Yes, I want to go, but I have a voice telling me I shouldn’t go because I would be going by myself and would feel like I’d have to talk to new people, and I don’t always feel like doing that, and then I would be self-conscious and not enjoy it, and so on. But I want to go. And, I’d already painted myself and found flip flips! And oh yeah, I met the person who created the show, and this is an opportunity to see it and see something awesome. Tonight. And, I can go and do whatever I want, talk to or not talk to people, and have a good time. I can just go and be. 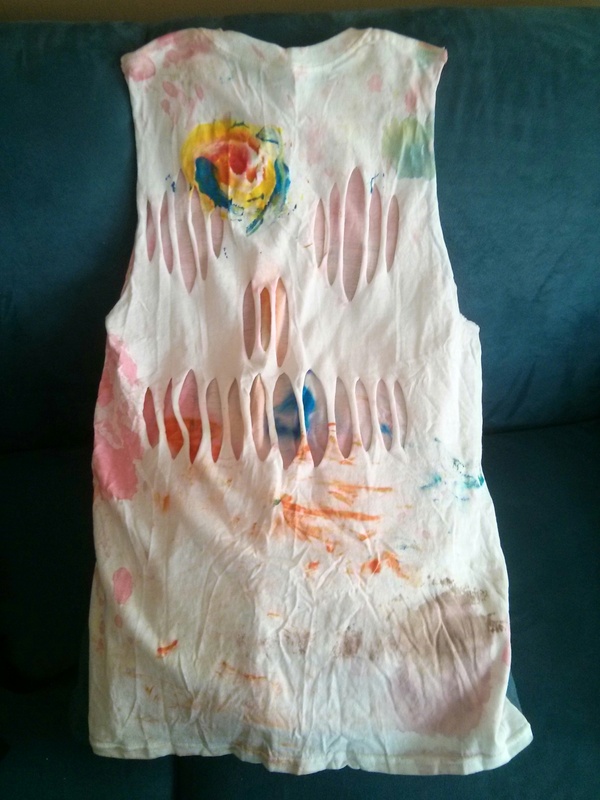 Once upon a time, I wrote about a Two T-Shirt Day. After entering the DRIP bar area and collecting my t-shirt before the show started, I was treated to a zombie-cutting and sleeves-ripping. And that, when combined with my half marathon attire and with the rest of my day, perspective seen and perspective shown, turned it into a Two Tank Top Day. 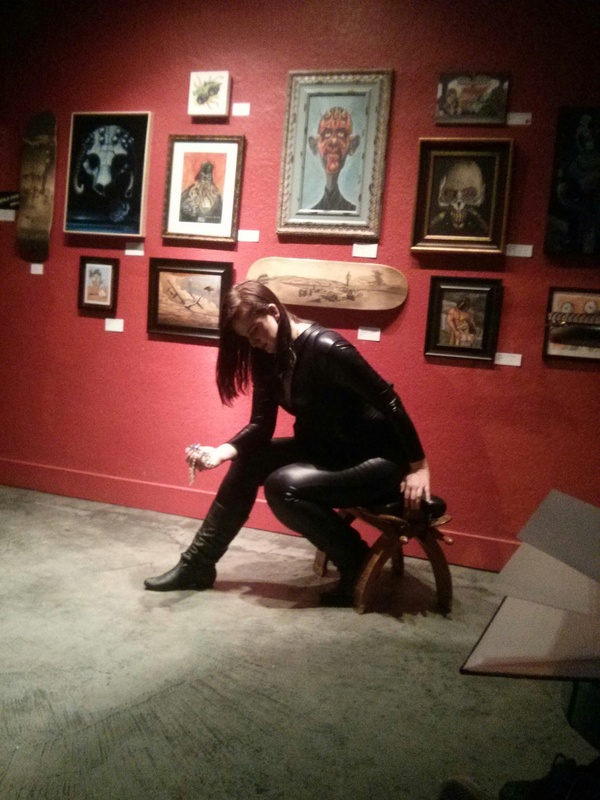 The show was amazing, and after it was over, I sat with myself for a few minutes in the bar area, continuing to be. Among the thoughts that came were, Yes, I’m okay, I’m doing okay, I’m me, I’m ready, Let’s go home, Let’s go. 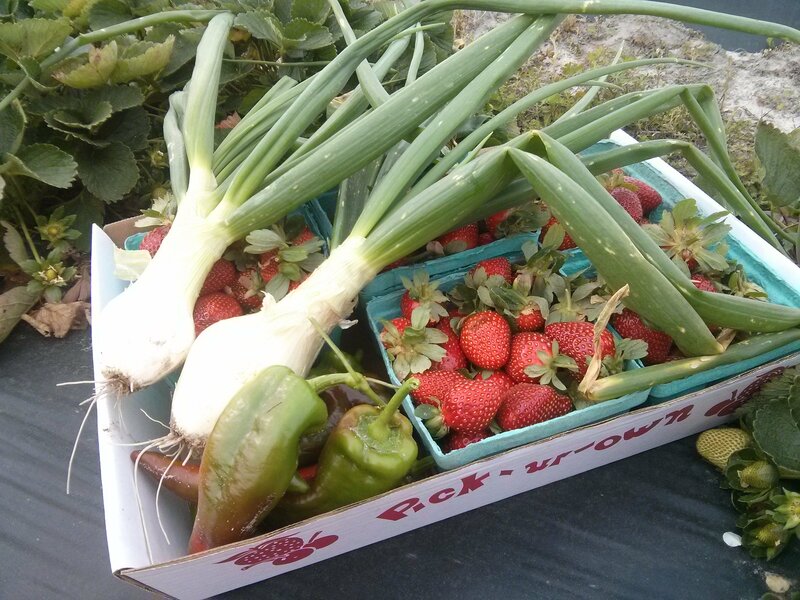 This entry was posted in Uncategorized and tagged appreciation, art, beets, food, improv, life, numbers, Orlando, princeton, running, verse, words on May 4, 2016 by dave379. There was walking and exploring and food trucks on Day 1. And running, hiking, singing, and swimming on Day 2. And there was going to be yoga, the beach, and art on Day 3. Those were my general Day 3 Thursday plans at least, which came together while hiking and swimming during the day on Wednesday and also while getting a drink back at a bar in Orlando Wednesday night. As it turned out, Thursday would also include a visit to a farm and a second art event. Which is to say: there was a lot going on, and at some points too much as I tried to follow my interests and do too much. But in the end, it was all good. The story continues. From my hosts, I’d heard about East End Market, a neighborhood market a mile and half away that serves as a food hub, merchant space, and community center. Inside there was a variety of local food businesses (bread, cheese, produce, juice, beer), a coffee shop, a small book store, a plants store, a restaurant, and more. 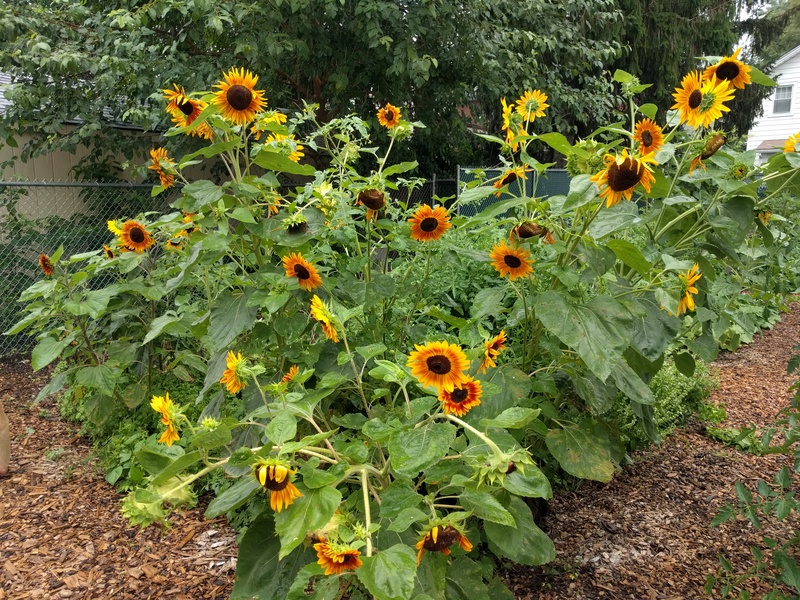 And outside there was a patio courtyard and a community garden project. And: everything Thursday morning, in partnership with Lululemon, there was a free yoga class! So I got up early, jogged to the market, and started the day with yoga. I hadn’t done yoga in a while – the last time was several months prior, coincidentally at a free Lululemon class in Princeton – and I was also planning on doing a half marathon in two days (yes, the Best Damn Race Orlando), so I took it easy. And I was able to relax and it felt good. 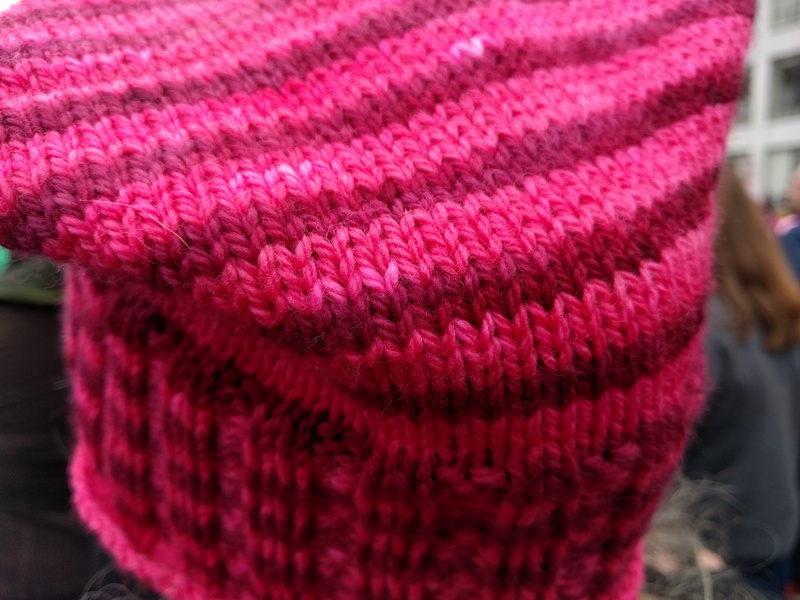 And with an intention set for the day – love and kindness all around, for myself and others – I got a sourdough loaf from the bakery and ambled around the market, inside and out, at my own pace. Most of the shops weren’t open yet, but it made me smile to learn that the offices of Edible Orlando were housed there (I picked up the latest copy). And I found a local farms guide! Before jogging home, I sat for a few minutes, relaxing and being. Where I got into a little trouble that day, back at the house and at other points, was when I started thinking that I needed to do certain things and to fit a lot of things in. I had the beach in mind, but now I also saw the possibility of visiting some local farms, and Google maps was telling me that logistically it would be possible to visit them on the way back from the beach, and then if I got back in time I could also go to this additional art thing that I’d learned about the night before at the bar. The timing would be tight though, and I couldn’t stay in any one place for too long. But it could work. But I’d be rushing. But it was possible. But I’d be thinking of next place and not relaxing in the moment. 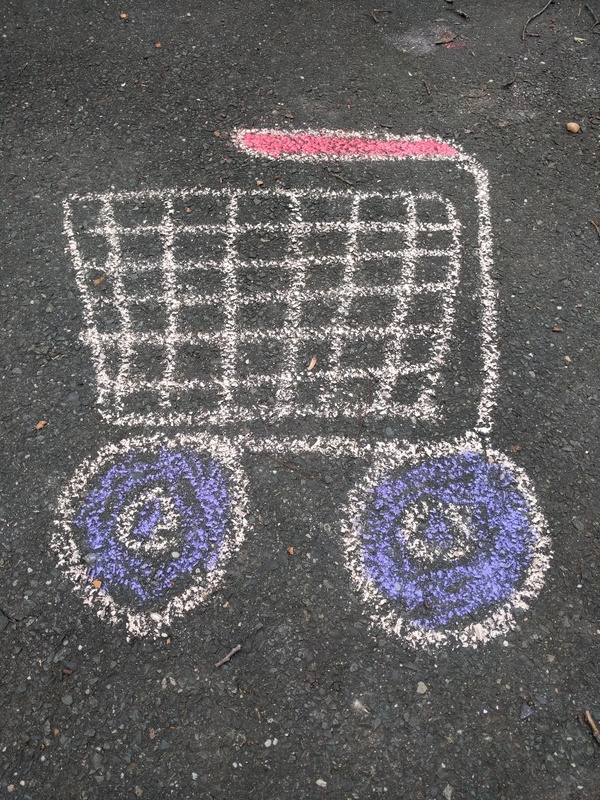 What should I do, what should I do… Wait, does this sound familiar?? Yes, to hike or to kayak, that is the question. In the end, I did them all and I had some stress about it. Who’s not perfect though? This guy. And who feels better having said that, and having lived and learned through it? Also this guy. 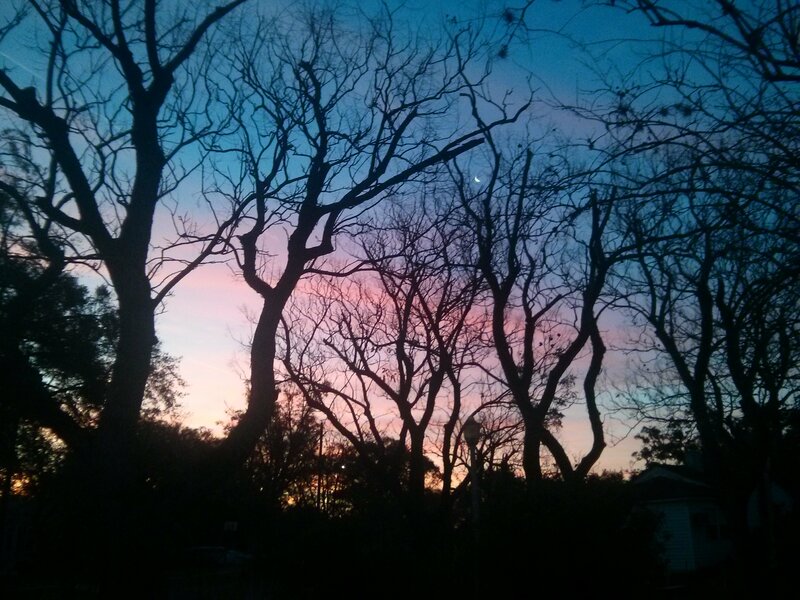 Let’s talk about this sky. 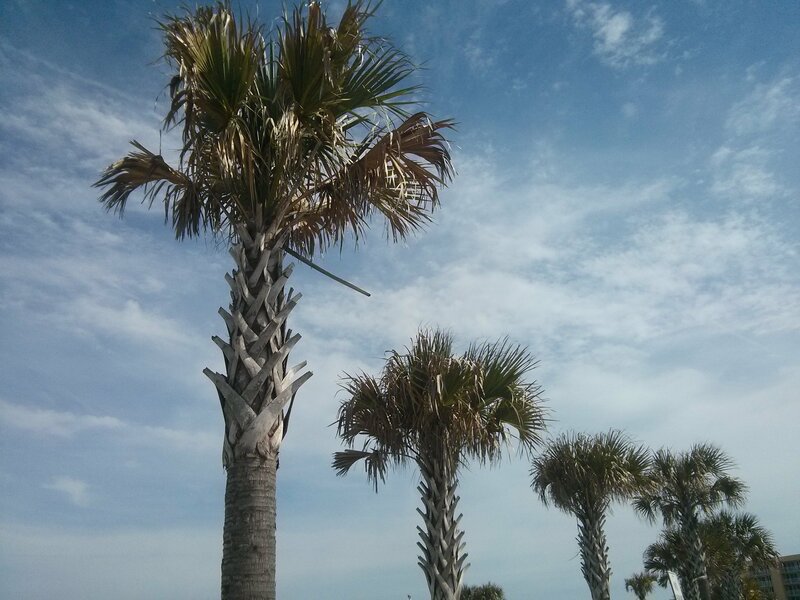 I brought my lunch with me to beach, and sat with this view. There were just a few others, enjoying it too. But if you wanted to drive, there was a $10 fee. 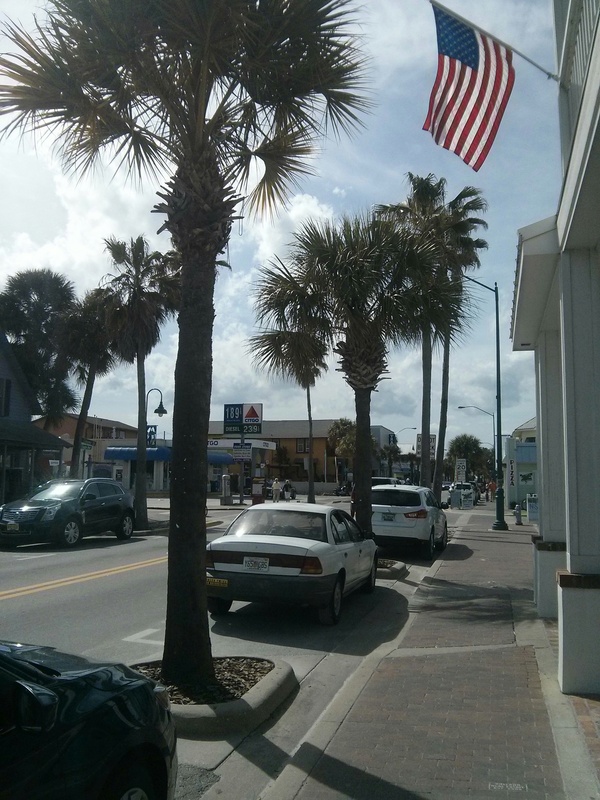 At the beach and in the street. Yes, stopping at the farm added something to the trip. 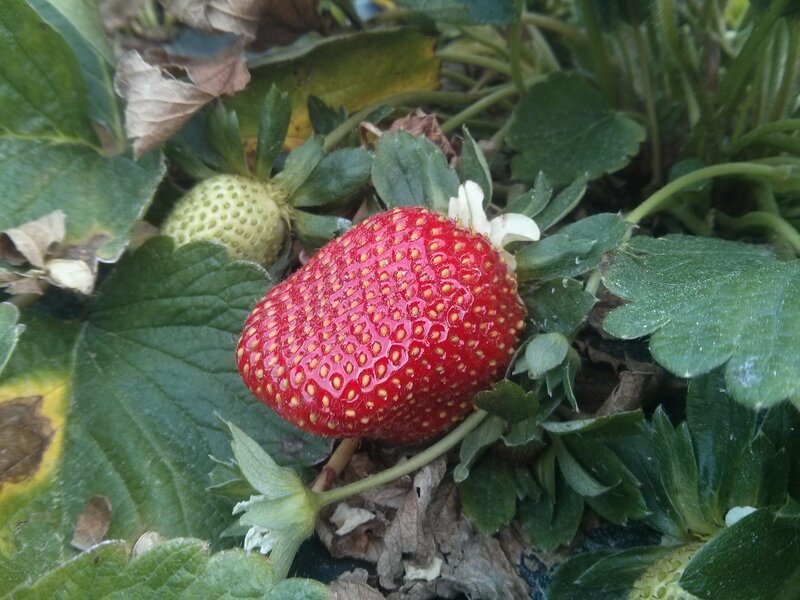 And strawberries in March, who knew! I didn’t get to also visit an orange grove, but in talking with the farmer while paying, I did learn a little about the orange industry. She told me how a disease, citrus greening, was threatening the entire industry and how her family had successfully transitioned from oranges to vegetables. Back in Orlando, the first art event I went to that evening was 1st Thursdays at the art museum (good, but with everything else that day and the timing of it, it became part of my day’s too much). 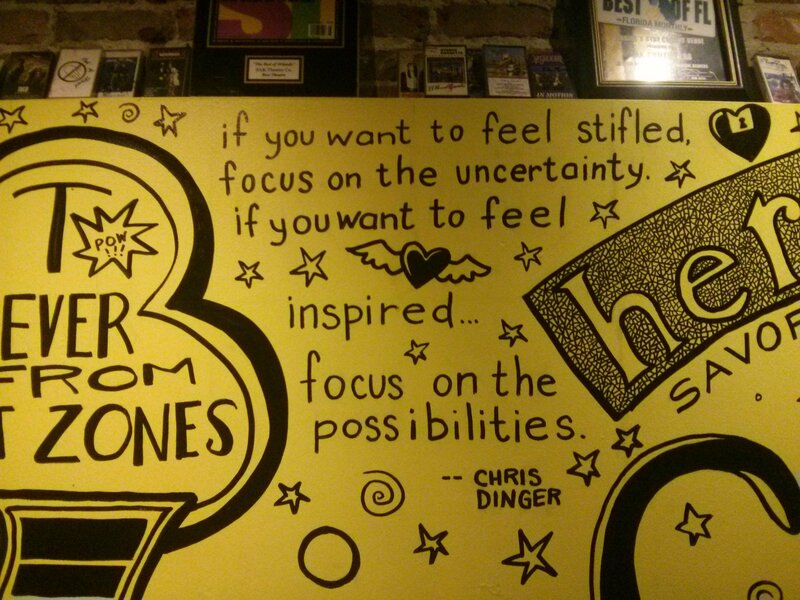 And then I went to Mystery Sketch Theater at the Falcon (better, because that’s what I really wanted to do). When my hosts had mentioned Mystery Sketch Theater – a monthly figure drawing session held at a local bar, where a live model dresses up as a superhero and other unique characters – I was like, “That sounds awesome, I would do that.” I like drawing, I thought, and it sounded like a fun social thing to do with like-minded people. Drawing, drinking, and hanging out, perhaps too with some new friends. I also happened to have brought with me from NJ a set drawing pencils, a sharpener, and a eraser (holiday gifts from one of my brothers that I hadn’t used yet). I’d packed them thinking that maybe I’d use them, and now here was an opportunity! So I bought a sketchpad and showed up. 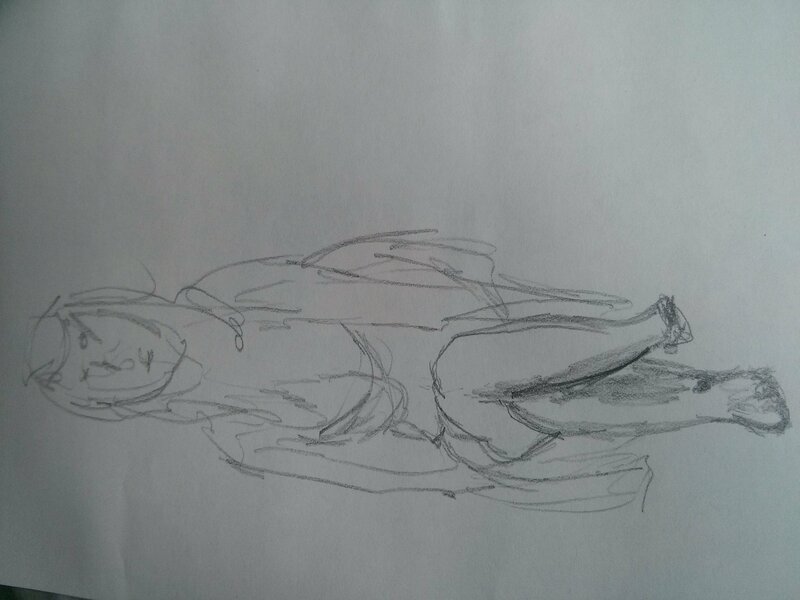 The model started with one-minute poses, as a warm up for us as well as for her. 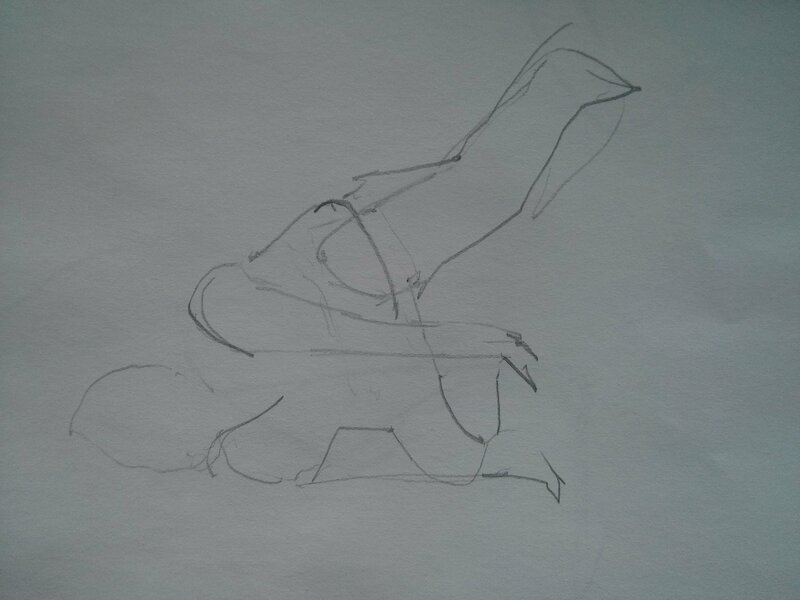 This progressed into 5-minute and then 10-minute poses. And then about half-way in, near the hour mark, she took a break for a costume change. 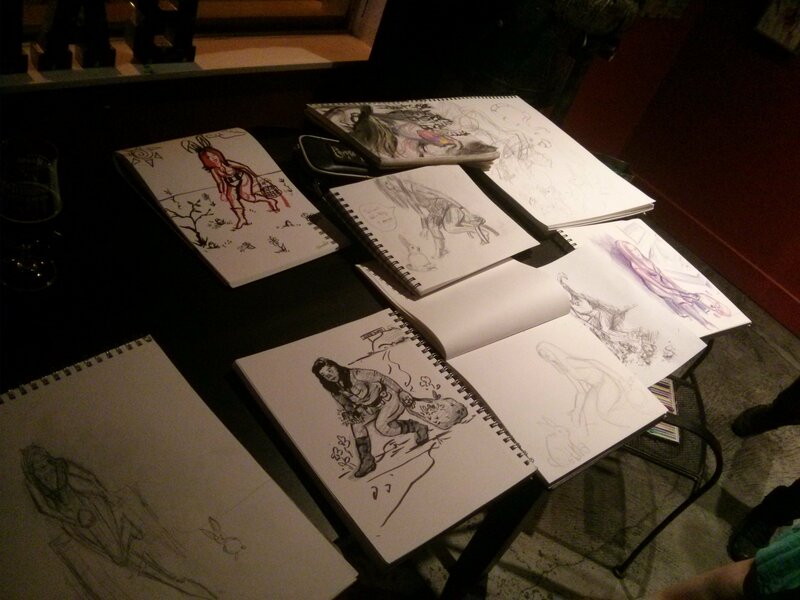 From 8 to 9 pm we were drawing a leather-bound Cat-woman type, and from 9 to 10 pm it was Ariel from The Little Mermaid. I liked the shortest poses the best – less time to worry about making mistakes. You have to dive in, draw, and be decisive with your lines. I found that the more time I had, the longer I often hesitated. 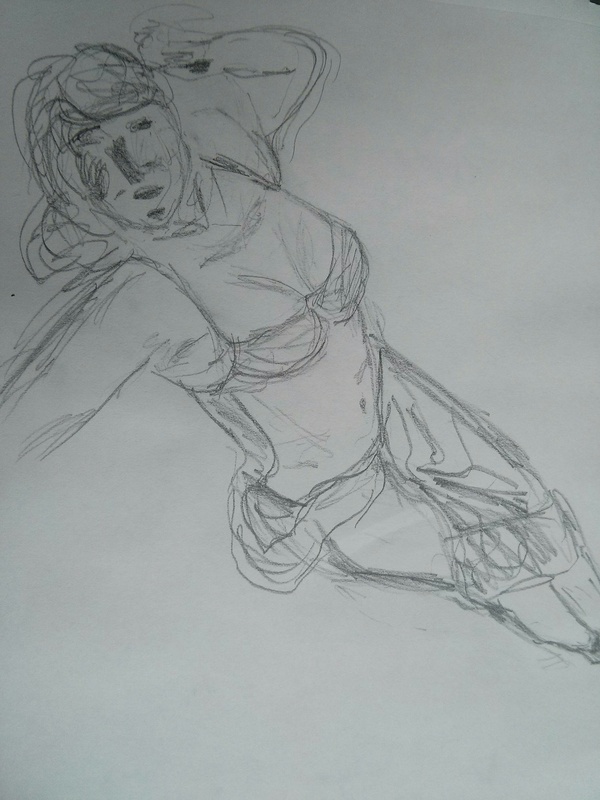 With some of the longer poses, I’d have very little done until I found out there was a minute left, and then there’d be a flurry of lines and parts in the last 30-60 seconds. Sometimes it would look okay, sometimes not. 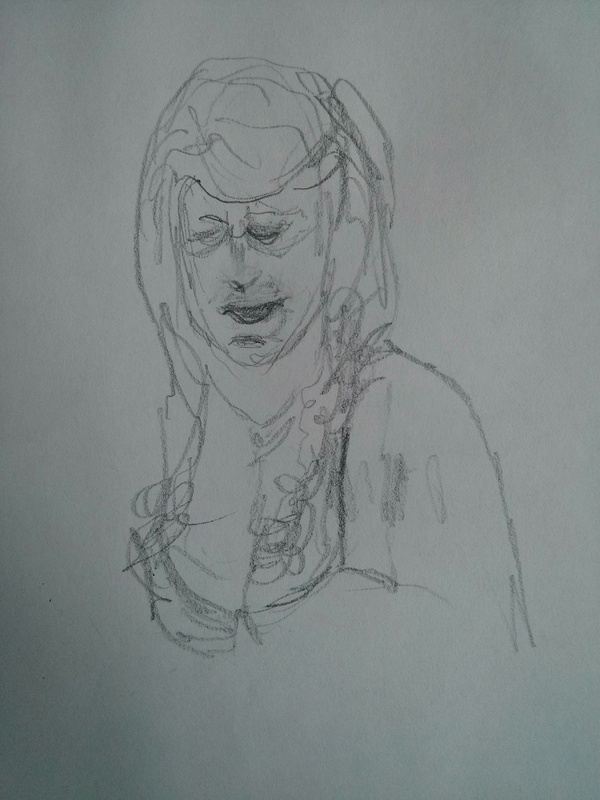 At a certain point, I could feel myself getting self-critical: “There are so many mistakes in my drawings. They’re not perfect! I’m not perfect! Other people’s drawings look better than mine.” And then it passed. The truth is, there were some talented artists that night at Mystery Sketch Theater. 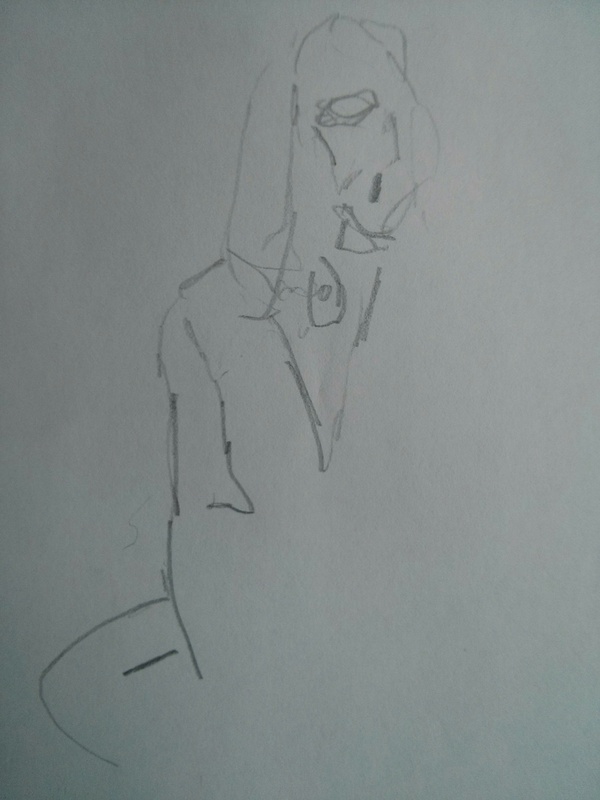 And while my drawings didn’t always have the right proportions or features (heads, hands, my undoing), that’s okay. I reminded myself, too, that to be good or great at something right away is unrealistic. As in, something that’s not real. And me? Yes, I’m real. And to get better at drawing, and anything in life – meeting new people, enjoying the present moment, seeing the beauty around you everyday – it takes time and practice. And with that in mind, I’m happy to say the following: Enjoy the rest of the art show! All the drawings, from top to bottom, appear in the order in which they were drawn. The more I look at them, the more I realize there’s something about every one that I like. A line, a leg, a look, a gesture, a smile, a something. Every one, just like everyone, has something special. I like each one on its own, and all of them as a group. Looking at them also makes me want to do more drawing. 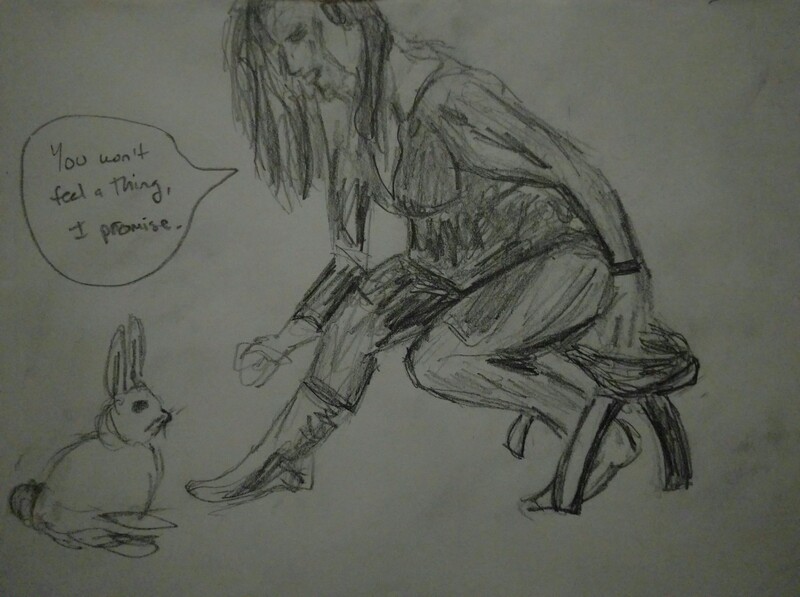 For context too, the one drawing with the words was the product of that night’s contest: Prior to everyone starting that one, which was the final drawing before the model’s costume change, the suggestion of “Stealing Easter” was selected as the concept for us to transform our drawings into while the model changed. I didn’t win the contest, but I won the day by drawing in a bar on vacation. It was a good Thursday decision. And after it ended, I got a bite to eat with two of the other artists. 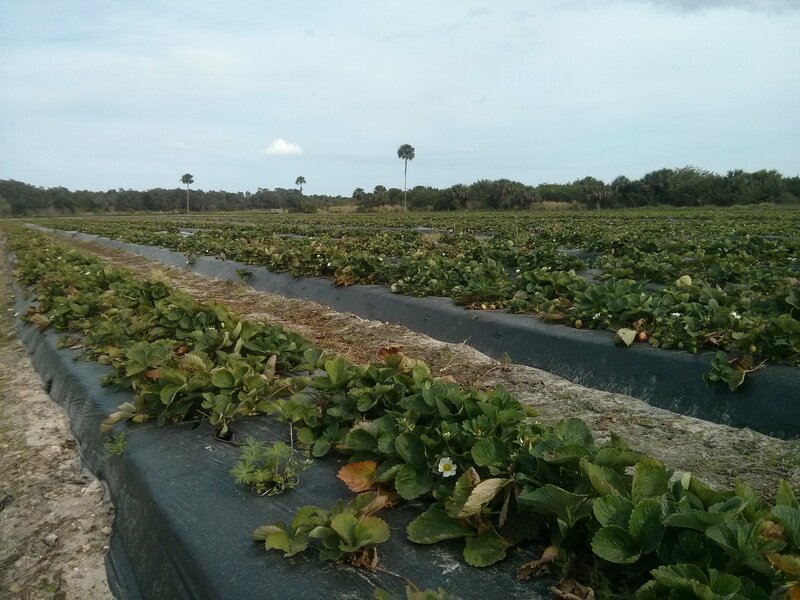 This entry was posted in Uncategorized and tagged art, beach, drawing, food, life, Orlando, strawberries, verse, words, yoga on April 14, 2016 by dave379.